Three Chords and The Truth. And a Couch. And a Cat. As I ride along north out of Livingstone, Zambia I’m listening to Red Dirt music from home — Turnpike Troubadours, Josh Abbott, Rob Baird, Whiskey Myers. It feels a bit odd listening to Texas music while riding through these small African towns where I am the only white face and the only motorcycle, but it also has some comfort to it. I’m thinking of the answer to a question I’ve been asked several times over the past few months: What do I miss about home? The short answer is “not much”. I’ve adapted to this lifestyle, and I don’t feel like I’m lacking or needing anything in particular. But to be fair, if I think about what makes me happy and comfortable, there are a few things I miss. My buddy Dexter. My cat is incredibly cool, and a great friend. He acts more like a dog than a cat sometimes, which is okay. 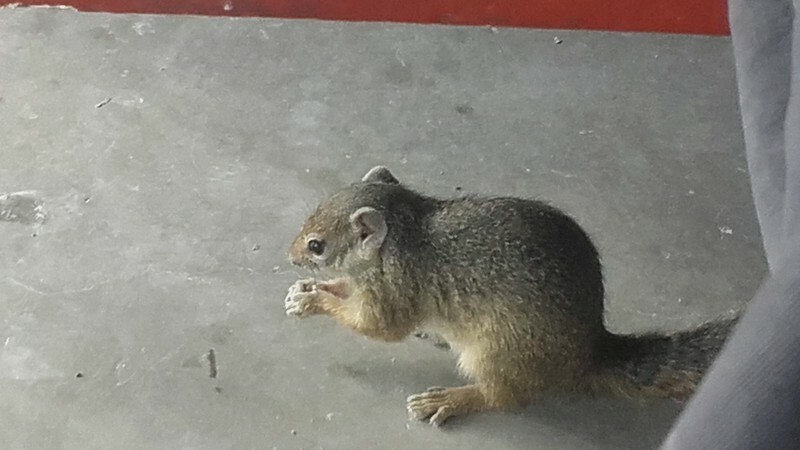 He loves to hang out in the shop or garage and be around bikes. And he loves people. A couch. Ok, my couch. A couch that I can really just plop down on, put my feet up and be comfortable. Yeah, I’ve sat on couches since I left home. But they’re not the same as the couch you call your own…the one you come home to every night. I had this brown leather chair that was really comfortable. I sold almost everything I owned before leaving home, but I kept that chair. I’m looking forward to sitting in it again some day. My guitar. Odd, since I haven’t played in a couple of years. I didn’t realize I missed this until about the twelfth time through the Turnpike Troubadours album, when I realized that I had most of the chords to the songs figured out and just wanted to sit and strum along. So if I could sit on my couch with my guitar and Dex, I’d be good. But honestly, right now, it would only take a week or two before I’d be missing the road again. I may have to re-think the trip….a sidecar would allow Dexter and the guitar to come along. The couch, well, that’s gonna have to stay home. 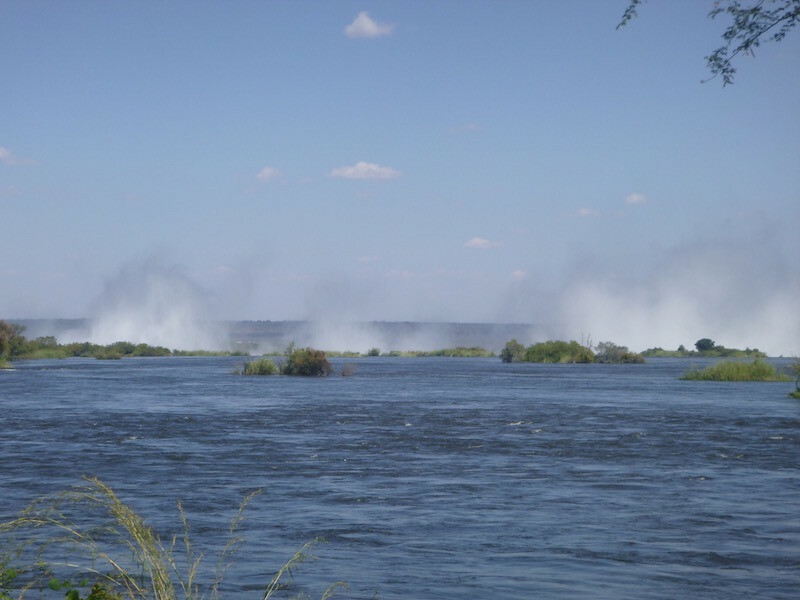 I’m staying on the edge of the Zambezi River, just about one kilometer up from Victoria Falls, known as Vic Falls to the locals. 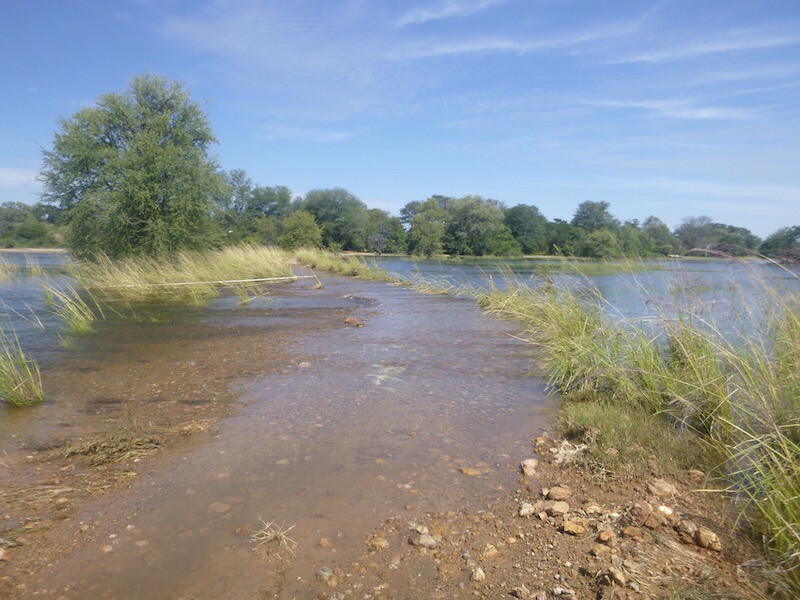 The river here is wide, with islands in the middle. On the other side is Zimbabwe. There is an island in the middle of the river, right at the falls. 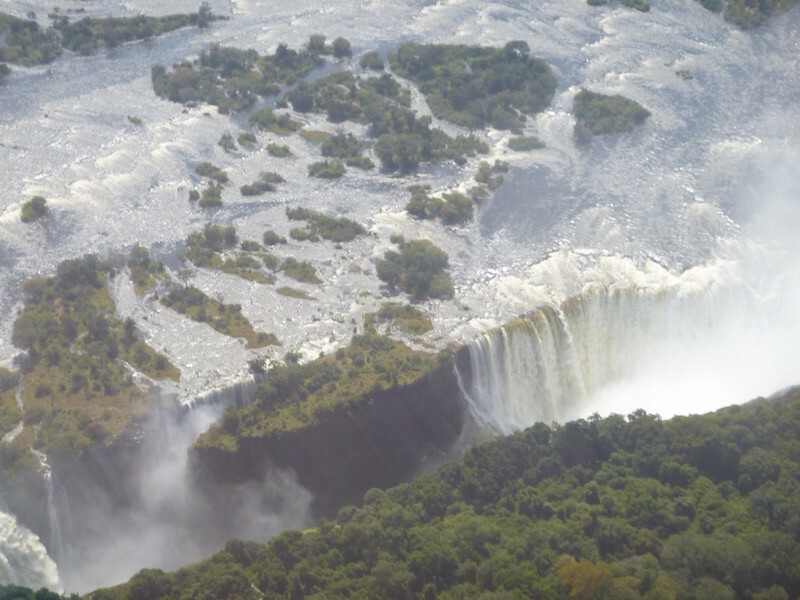 Apparently, this is where David Livingstone stood and first viewed the falls that he named for Queen Victoria of England. 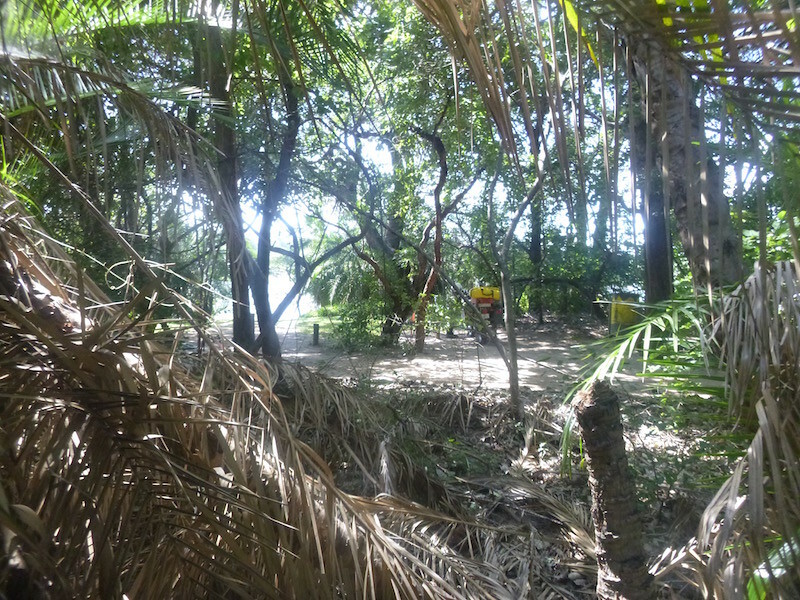 On the other side of my tent, about 200 meters through the trees, is a runway. I’ve been listening to helicopters and micro-lights take off and land all afternoon, so I decide I’ll go check it out. 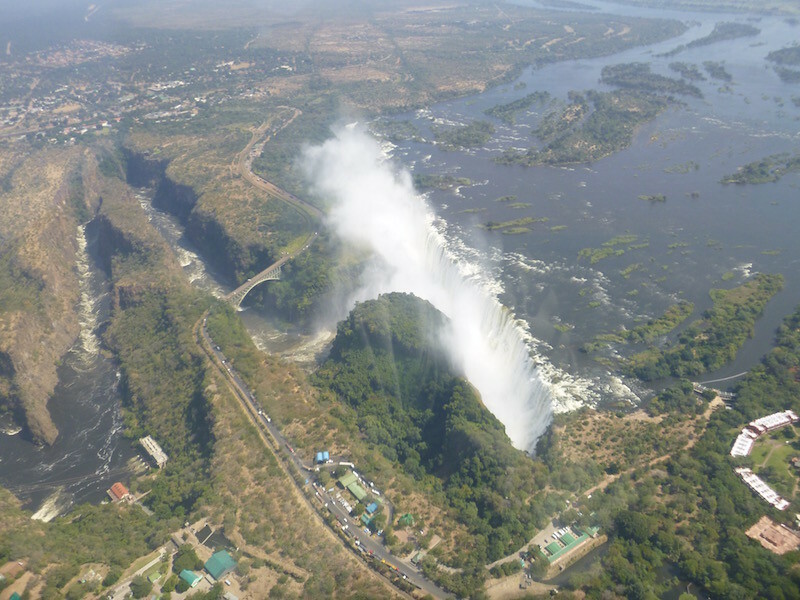 Rather than spend the money, time, and hassle to take the motorcycle across the border to Zimbabwe, where there is a better view of Victoria Falls, I decide to do a 15 minute helicopter flight over the falls. 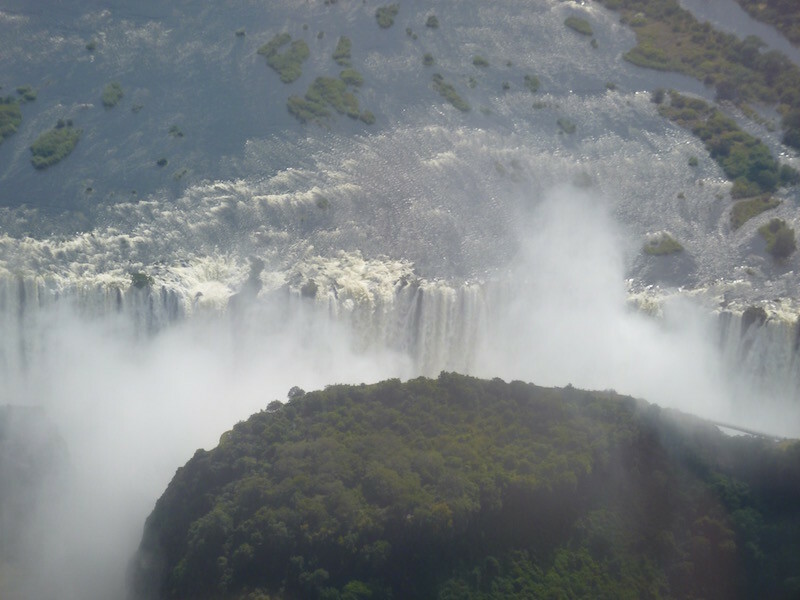 It’s possible to go through immigration and get a pass to walk out onto the bridge that connects Zambia and Zimbabwe in order to view the falls from this no-man’s land, but I’ve decided the best overall view is from the air. It’s a big bite out of my budget, but I’ve been saving quite a bit by camping every night, so I reward myself with the helicopter ride. It is definitely worth it. 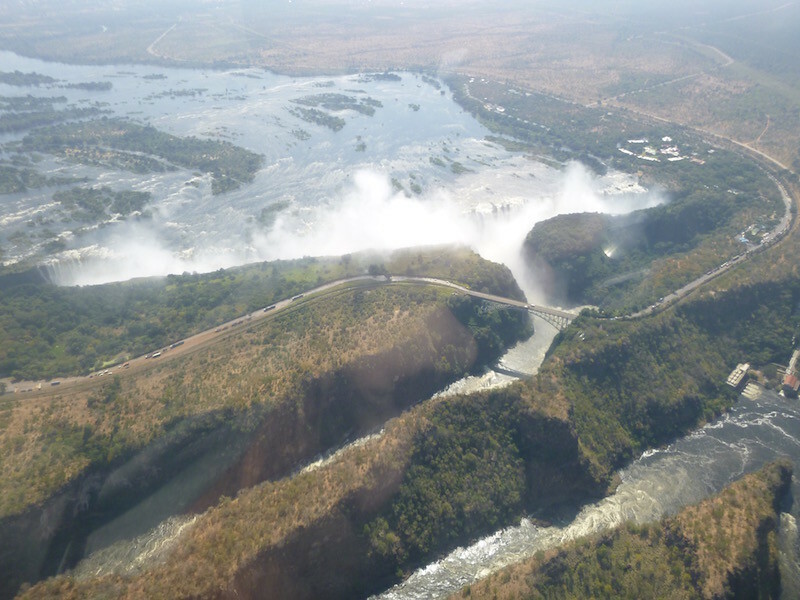 I don’t think I would have understood the geography of the falls without seeing it from the air. Victoria Falls drops into a canyon that, unlike most waterfalls, runs perpendicular to the river above the falls, and zig-zags back and forth several times before continuing on into Zimbabwe. Each of these canyons was once where the falls were, but over time the falls have edged back to where they are today. 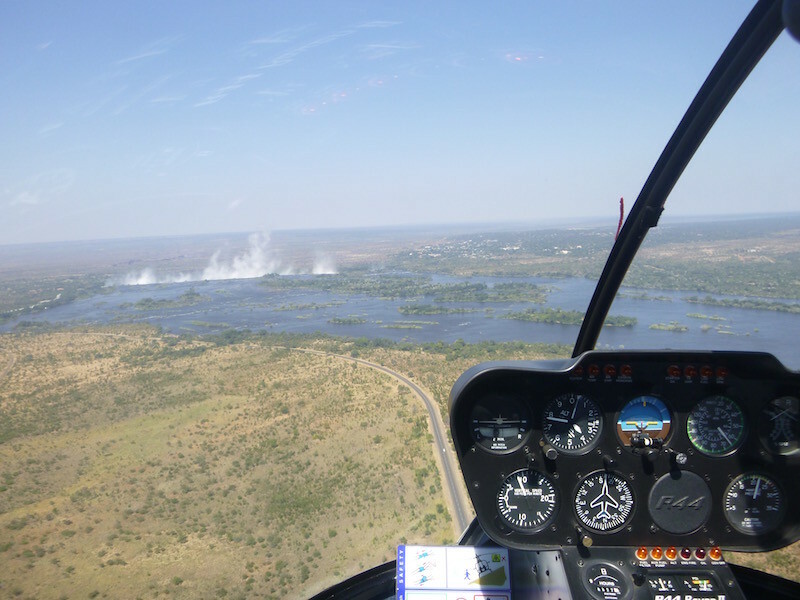 Approaching the falls in a Robinson R44. 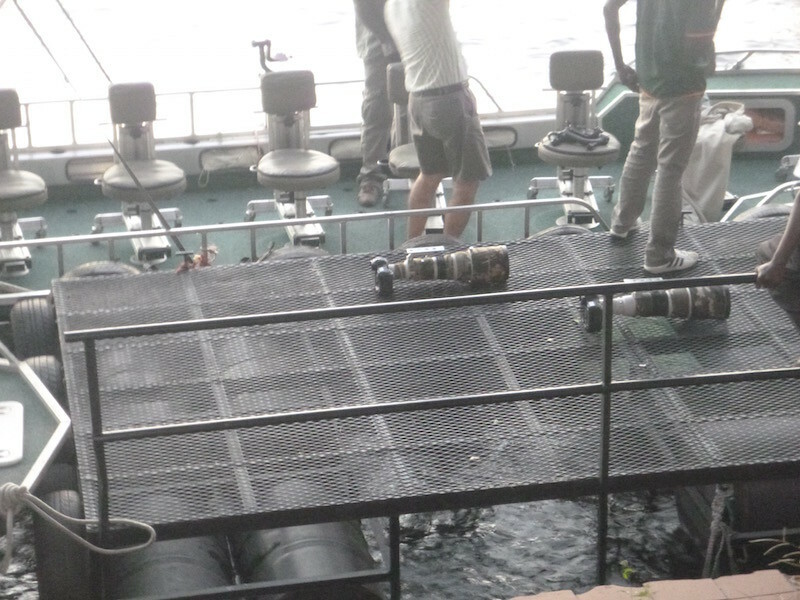 You can see the bridge connecting Zambia and Zimbabwe, and the bungee platform in the middle of the bridge. 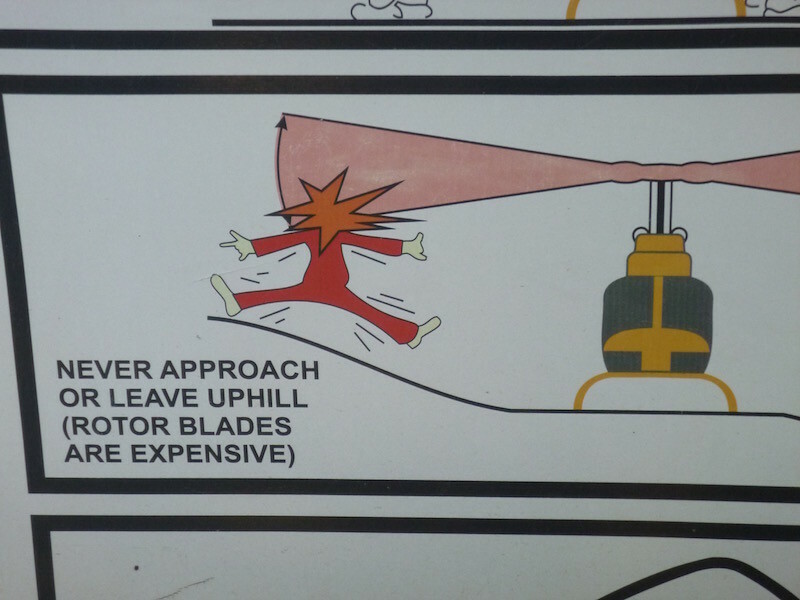 Gotta love the attitude on the warning signs. The bridge connecting Zambia to Zimbabwe has a bungee platform, a swing, and a zipline. Tempting, but I’ve spent enough here already. 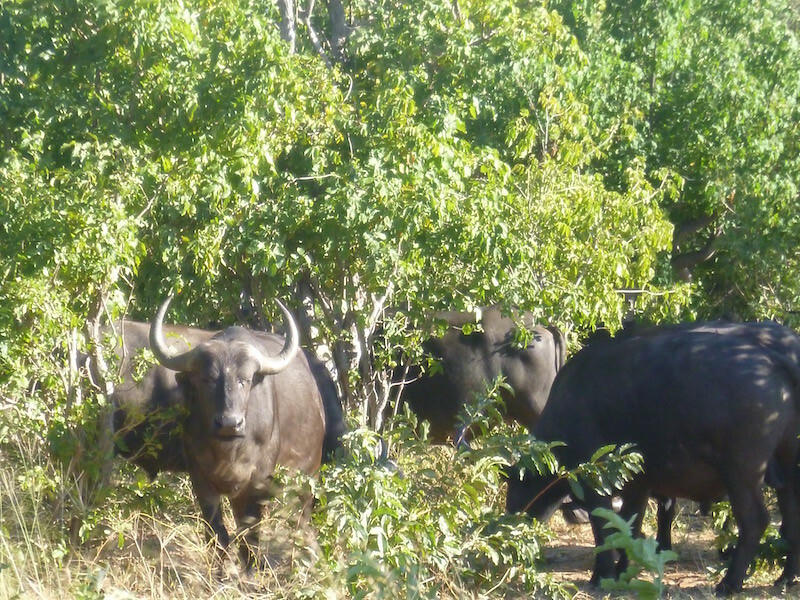 Tomorrow I’ll pack up and start heading north towards Lusaka. I shot video with the GoPro from the helicopter also, but I’ll have to find some better wifi before I can upload it. I’ll add another post once I get it uploaded. And one more photo tribute to Lloyd…I don’t recall if he ever made it here, but this is definitely another one of his kind of places. Today marks nine months since I left San Marcos, Texas on this trip. It seems like yesterday. The places I’ve seen, the people I’ve met, the memories I’ve made….it all flows together and feels like it could go on forever. 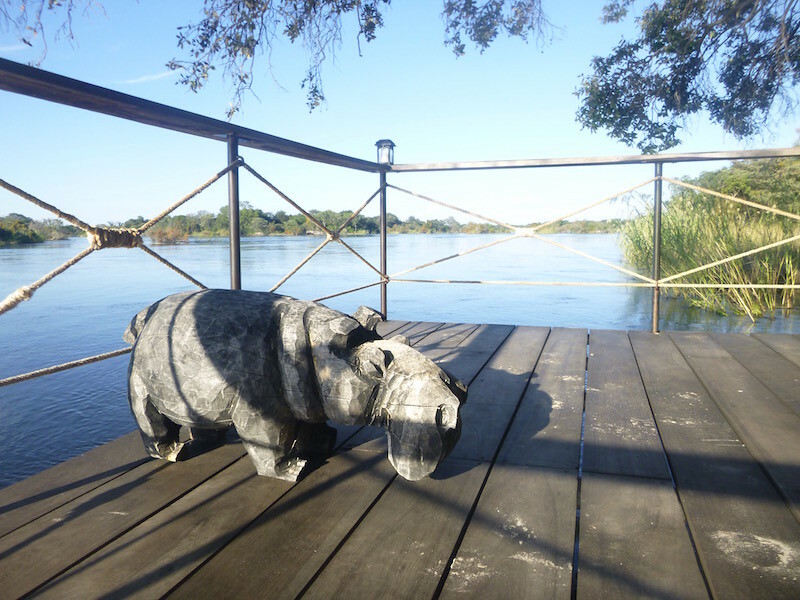 I spent two days and two nights in Kasane, Botswana at the campgrounds of the Chobe Safari Lodge, which allowed me time to take a three hour game drive in one of their vehicles through the northeastern end of Chobe National Park. 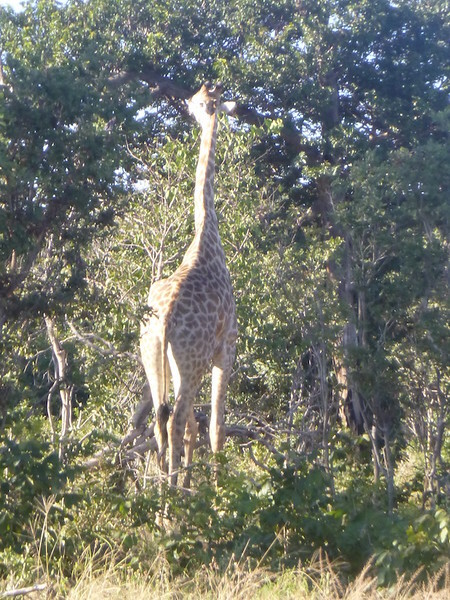 I saw a lot of buffalo and impala, a couple of lions, some giraffe, and an elephant. But still no leopard. Of the “Big Five”, that’s the one I’ve missed. 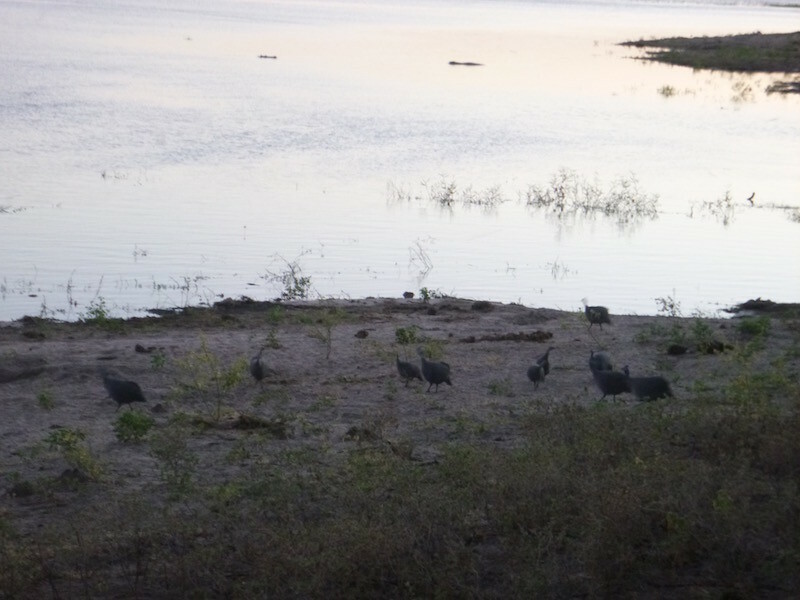 I did see a lot of guinea fowl though, and I saw them in Etosha as well. But here they call them Chobe Chickens. Buffalo on the edge of the river at sunrise. I’ve forgotten the name of this bird, but it was beautiful. 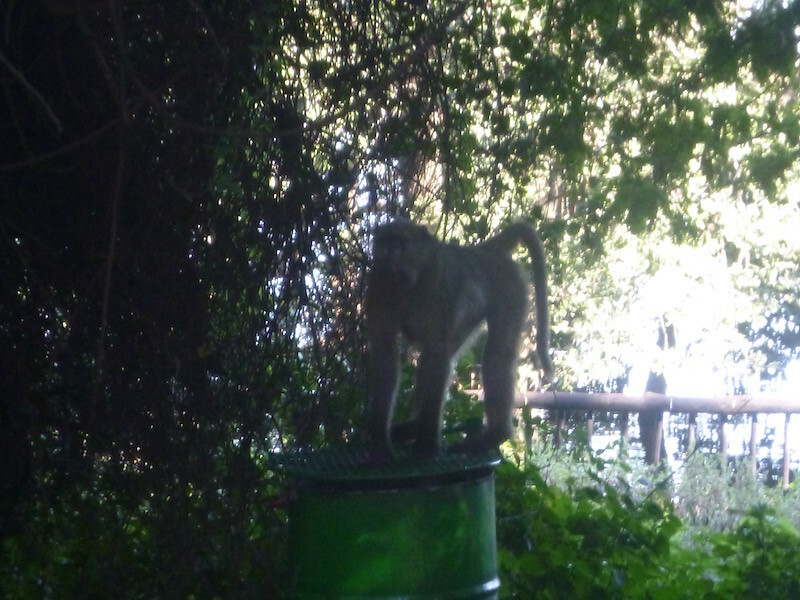 As I was packing up to leave Kasane, the baboons made an appearance at the camp. 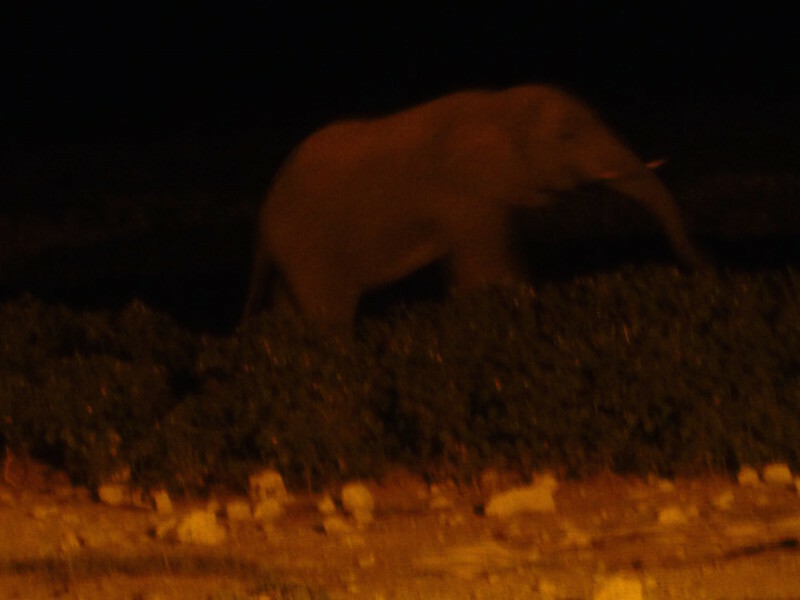 The wildlife just in the campground is pretty amazing, if you can be satisfied with warthogs, mongoose, monkeys and baboons walking around you at all hours. 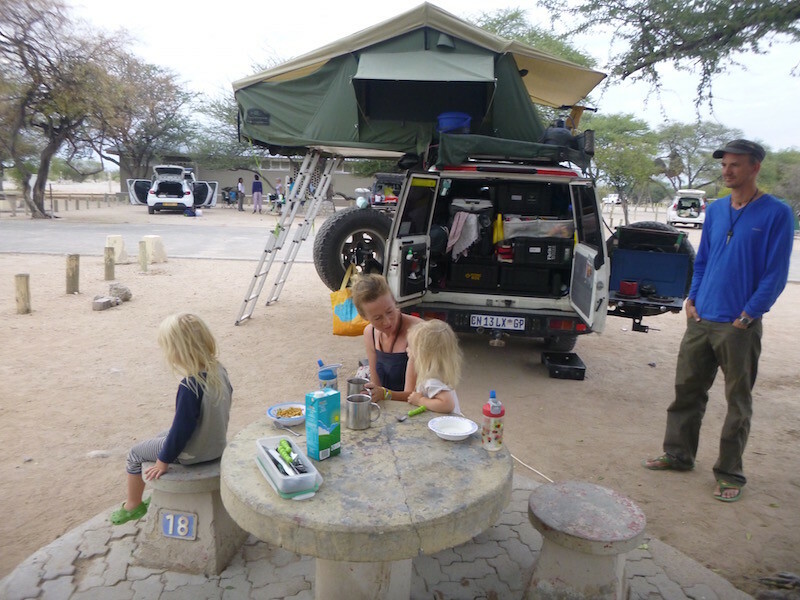 I also met a family from Rhodesia (now Zimbabwe) who were traveling together in a 4×4 on a two month journey. Baz saw my bike and the Texas registration, and stopped to talk. 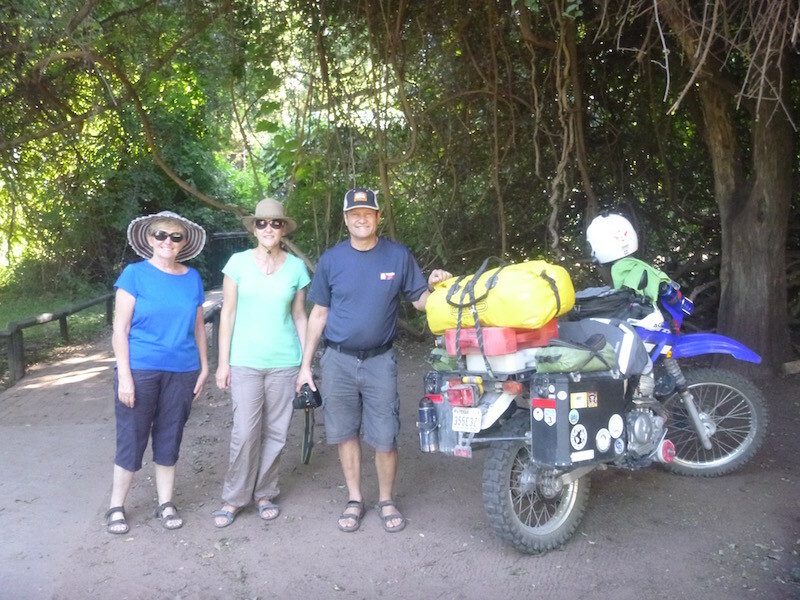 While his sister, brother, and sister-in-law still live in Africa, he’s lived in Canada for 25 years, working for Toyota, and has an XT250. Like most others, he never thought of riding it any long distance. Now he’s having other thoughts. 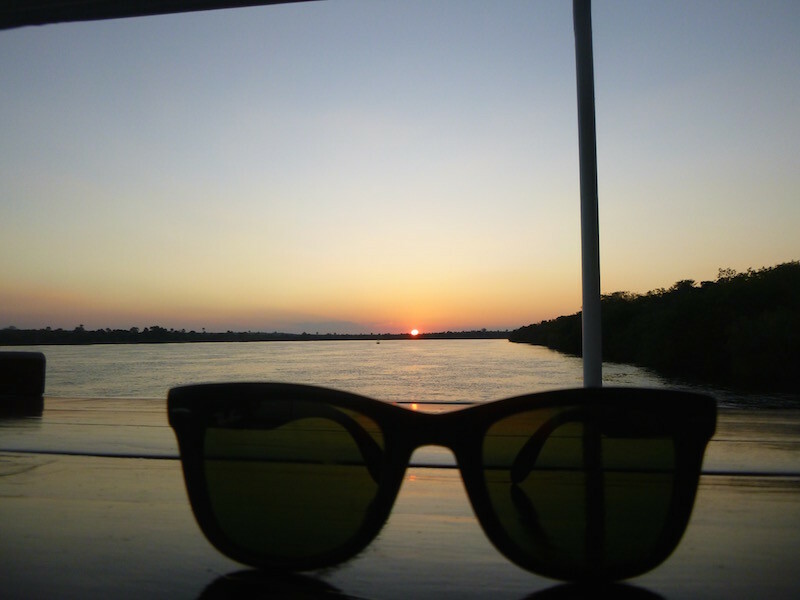 I headed back across the border to Zambia on the Kazungula ferry, and east to Livingstone. As I left Kazungula, the road condition improved and I had nice pavement with painted stripes all the way to Livingstone, where I intend to camp for two nights. In America, they call it SURVIVOR. In Africa, we call it CAMPING. 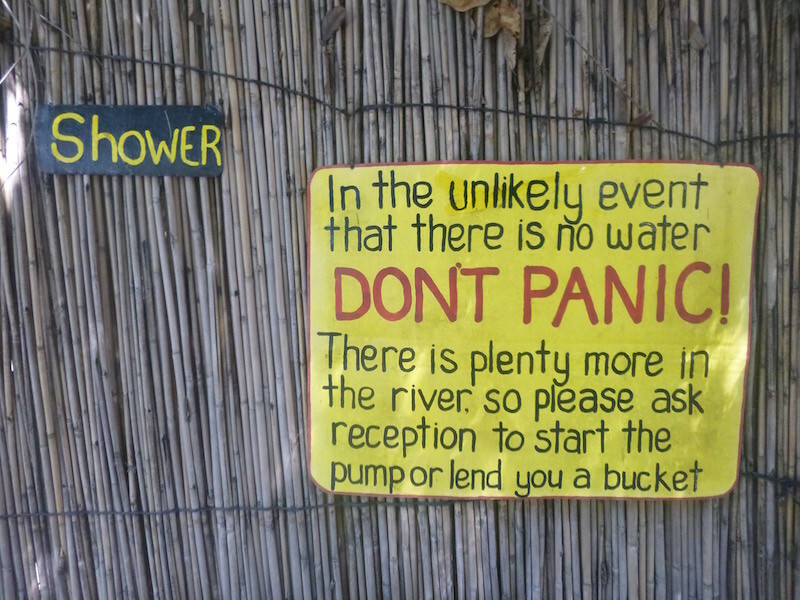 Tip #1: Close to the river is nice, but not TOO close. Tip #2: Zip up the tent, regardless of how short you intend to be out of it. Tip #3: If taking a nap in the chair, remain calm when you wake up to a noise. They will usually walk around you. Tip #4: Do not get between the hippo and the water. 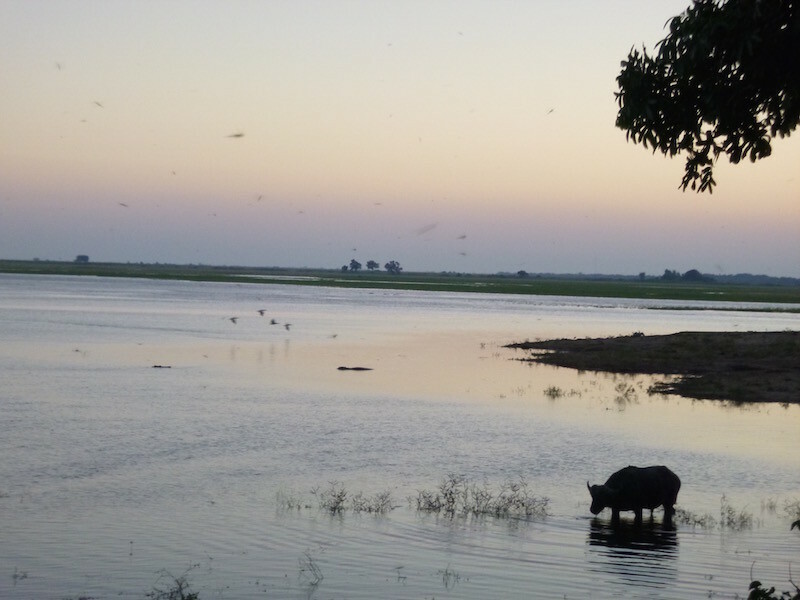 Those two black bumps in the middle of the photo are hippos. Or as they call them around here, “Eepos”. Tip #5: When cooking dinner, expect company. Tip #6: Choose your shade wisely. Everybody wants to be in the shade in the heat of the day. Tip #7: Always look outside the tent before climbing out. 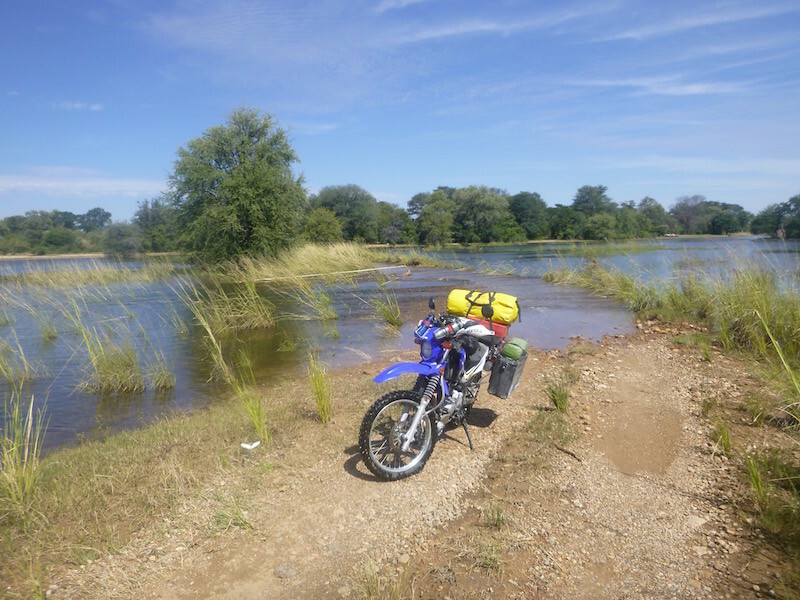 I left Ngepi Camp mid-morning for a 340 kilometer ride across the Caprivi Strip, that narrow portion of Namibia that stretches between Angola, Zambia, and Botswana. One last bathroom photo before I leave Ngepi Camp. This bathroom had the typical signs on the outside: one pointing to the “Ladies” entrance, and one to the “Gents” entrance. Turns out they both went to the same place eventually. Check out the details: pink plush on the Ladies side; lid padlocked in the “UP” position on the Gents side. 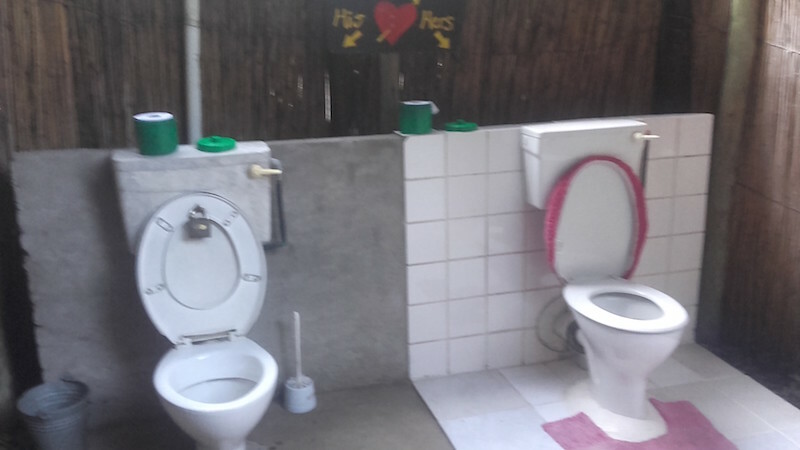 I didn’t visit all of the bathrooms at Ngepi, but they actually have a walking tour of the restrooms. 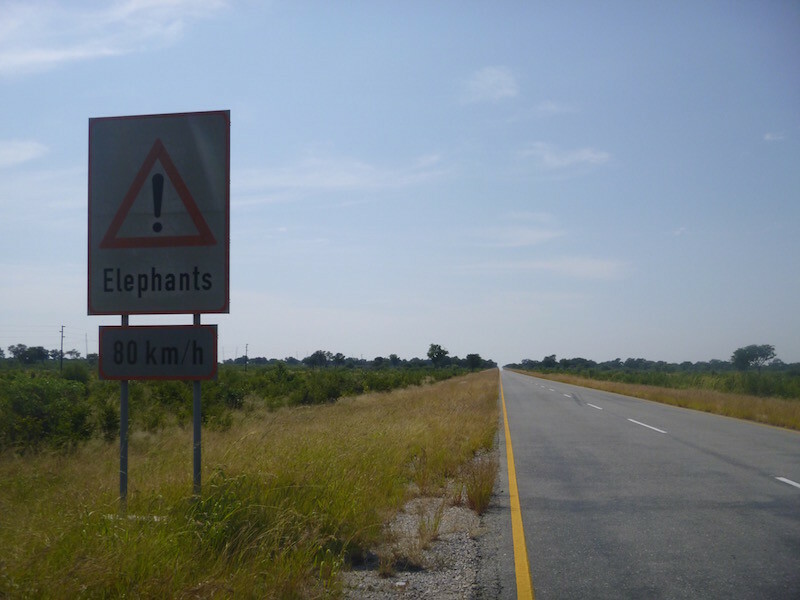 The Caprivi Stip highway is a very straight, very flat road through what used to be known as the Caprivi Game Park, but is now Bwabwata National Park. 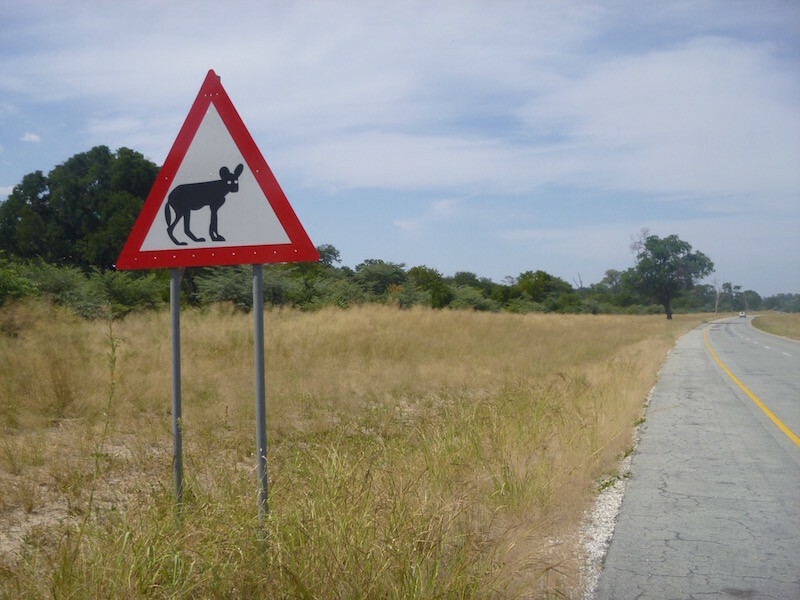 Lots of these signs along the Bwabwata National Park road. I crossed in the heat of the day, so I didn’t see any elephants. 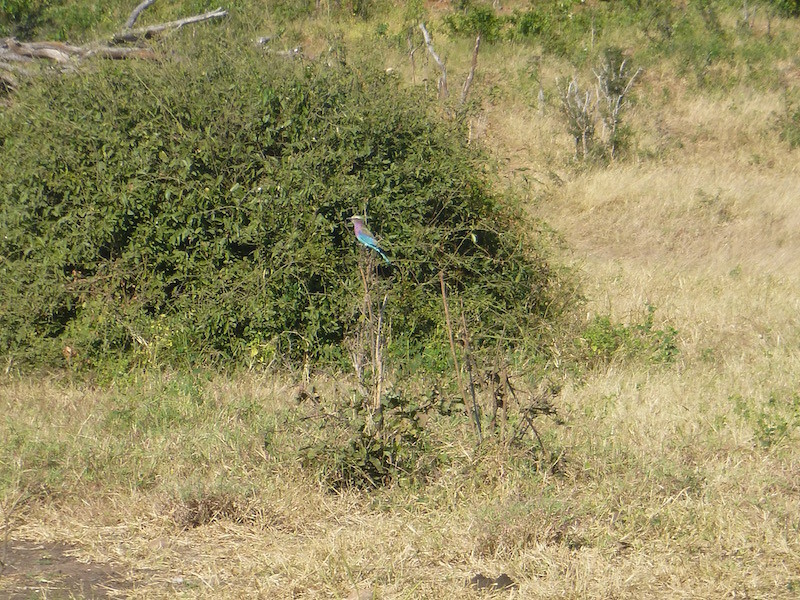 Others told me they saw quite a few in the early morning. 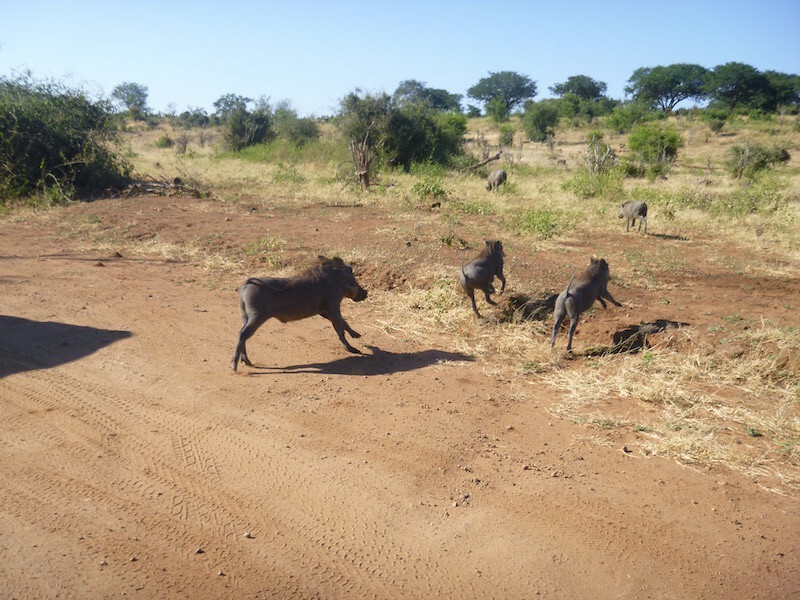 I didn’t see any of these evil hyenas with white eyes either. Growing the local economy by using available resources. A little more than half way across I came upon an 18-wheeler lying on its’ side on the opposite side of the road, but facing the same direction I was headed. It clearly hadn’t been there long, as there was a crowd of locals gathering around it. As I slowly rode past, I looked in my mirror and saw a pair of legs sticking through where the windshield used to be. I turned around and went back, thinking at least I had a first aid kit on the bike and possibly could help. I parked the bike and walked up to the driver, who was sitting in the cab with his legs sticking out. As he saw me approach, he climbed out. I asked if he was okay and he said he was fine, although he was clearly embarrassed at having turned the truck over on a flat, straight stretch of road. He couldn’t have been more than 20 or 21 years old, and didn’t seem to have a scratch on him. Very lucky. There didn’t appear to be anything I could do to help, so I got back on the bike and continued on. I was thankful that I didn’t meet him coming the other direction a few minutes earlier. 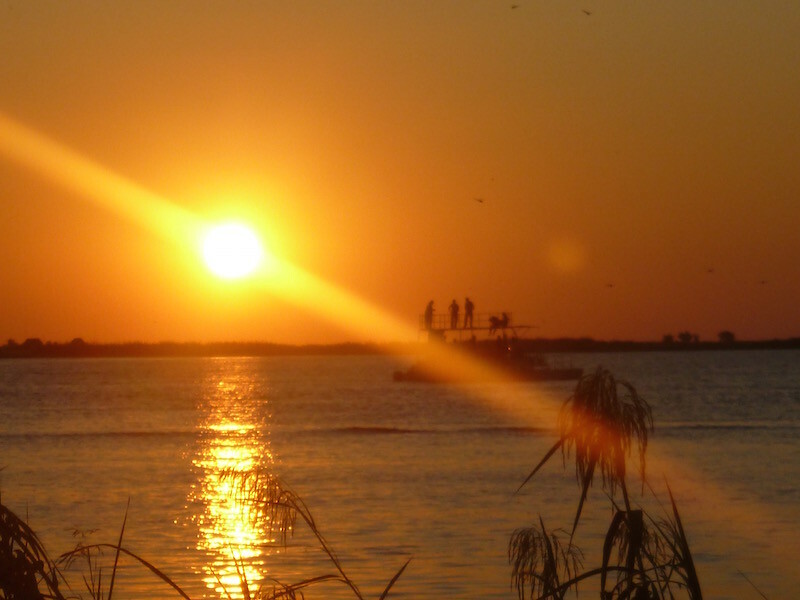 I spent Saturday night in my tent at Caprivi Houseboat Lodge, which I thought was an odd name for a campground, until I saw that they actually have several houseboats that they rent out as rooms, in addition to a few land-based chalets, and the campsites. So basically $140US to cross into Zambia, a country with poorly maintained roads and a struggling population. Where is all that money going? 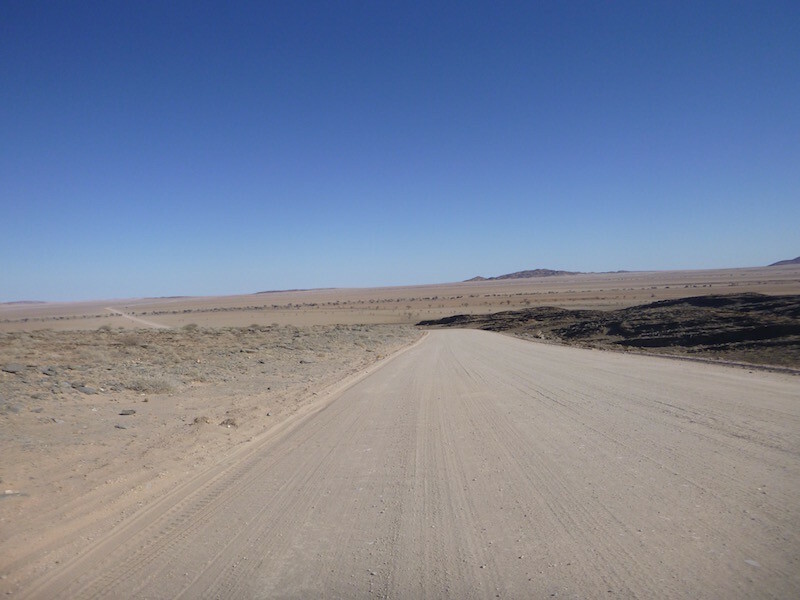 I paid only a small road tax fee to enter Namibia, and the roads that were paved were nicely maintained. More than once, I was told by immigration and customs that they don’t see many motorbikes through here. I seemed to be a rarity. I glanced at the logbook that I had to sign at several windows, and didn’t see another motorcycle listed, nor another US citizen. 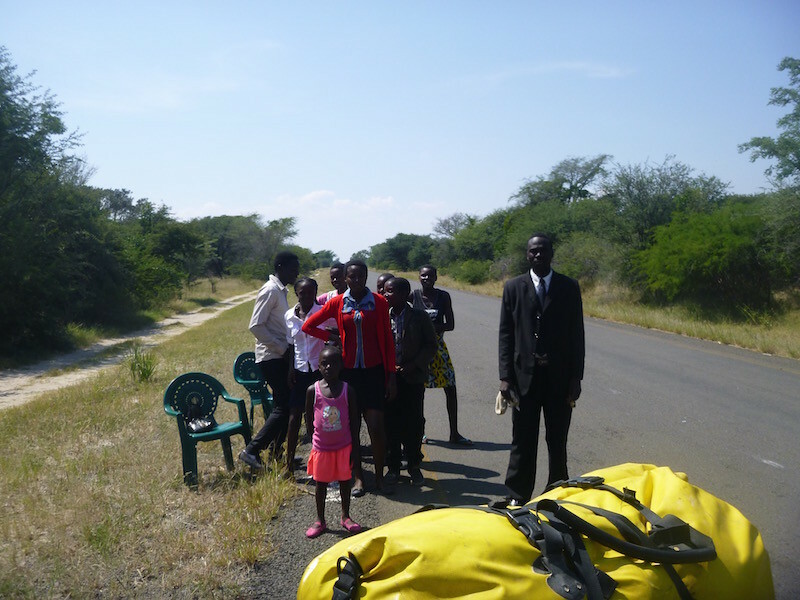 Not long after crossing into Zambia and passing through Sesheke (just past the border), the road began to look like many of the roads in rural Mexico and Central America: potholes stretched across the road and prevented a clear route through at more than about 50 to 60 km/h. There were very few cars, but I did encounter a few big trucks that were struggling to get through the potholes. It was Sunday morning, and there were a lot of people on the road. Not cars. People. In a 140 kilometer stretch, I passed hundreds of people walking alongside the road, dressed in their Sunday church clothes. Women had nice dresses. Men wore suits with ties. Many carried plastic lawn chairs. They clearly walked miles to get to church and then home again. On their way home from church. I had passed dozens of similar families before turning around to ask if I could take this family’s photo. When I approached, there was clearly fear in the eye of several. I think they were unsure of why some white guy on a motorcycle was approaching them. When I asked to take their photo, they didn’t understand enough English to figure out what I wanted, until I pulled the camera out of my pocket, and suddenly they were all laughing and relaxed. They all wanted to see the photo after I took it. 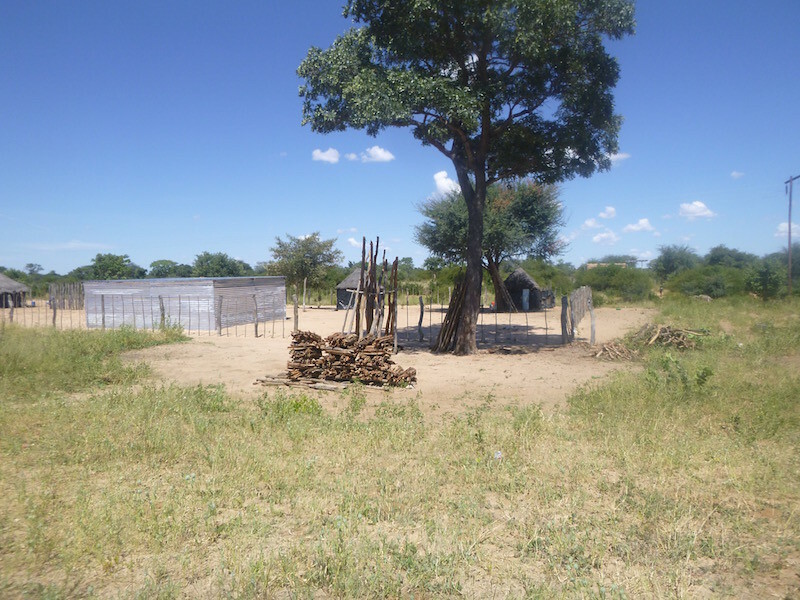 Their homes were the same “local house” 8×8 foot or maybe 10 to 12 foot diameter circular hut in a dirt clearing surrounded by a fence made of tree limbs. 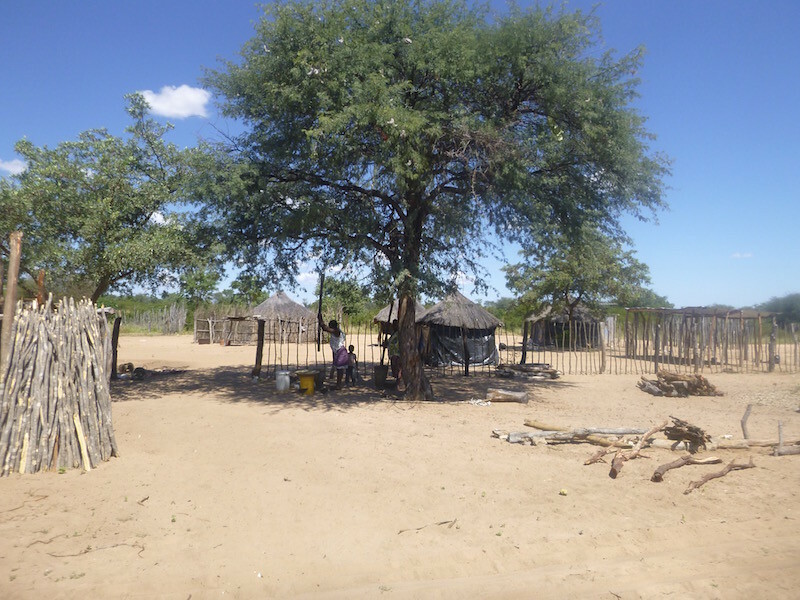 In fact, nearly all of the homes are this style, though I did begin to see some that were made of mud or adobe walls rather than just the tree limbs I had seen earlier in Namibia. I couldn’t help but wonder where they kept their clothes in these small homes, as everything they wore looked so clean and well cared for. Even though the houses are very basic and surrounded by nothing but dirt, the women sweep the dirt floors and the dirt around the house nearly every day. They do their best to keep everything clean and orderly. 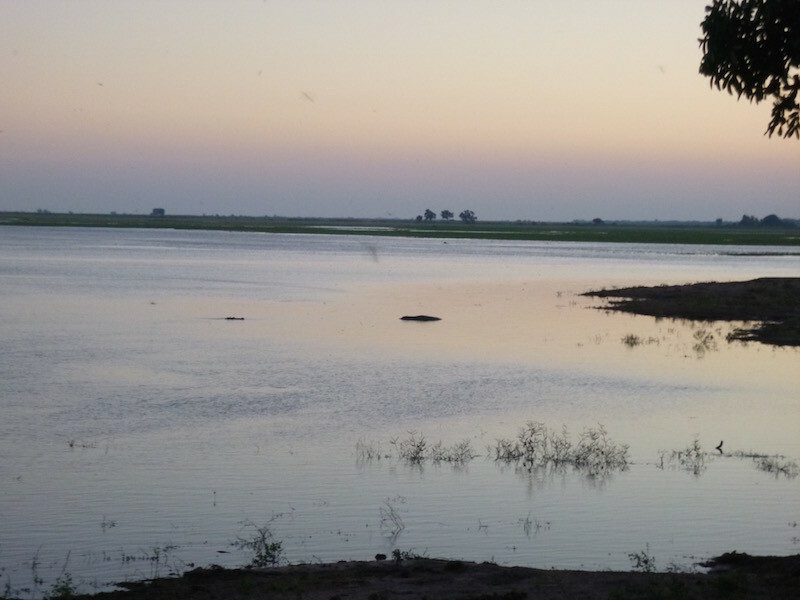 Eventually I arrived at Kazungula, and turned onto the road toward the ferry crossing into Botswana. I began to pass more than a hundred 18-wheelers parked alongside the road. This again reminded me of Central America. And sure enough, when I arrived at the border post, I was immediately approached by “helpers”, another sight I had not seen since Central America. 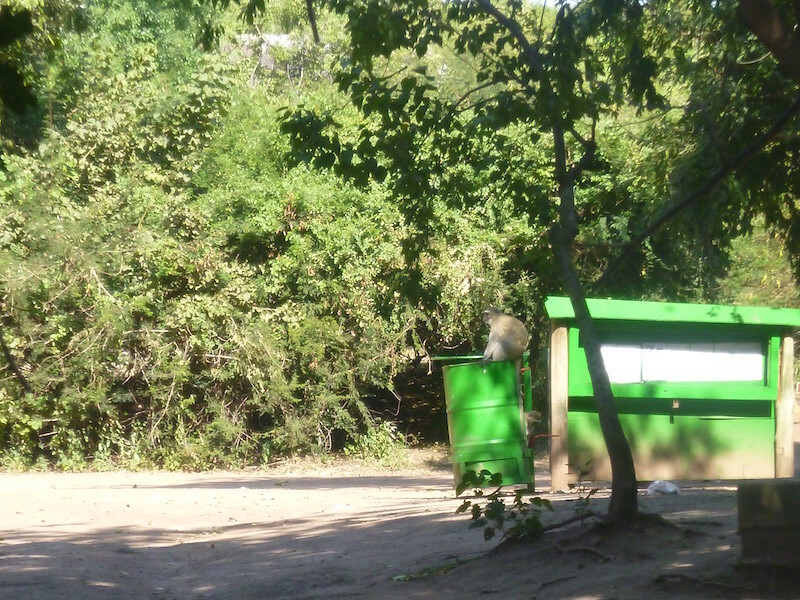 This phenomenon seems to occur in the poorer countries, and in this case, it was only at this Zambian border post. 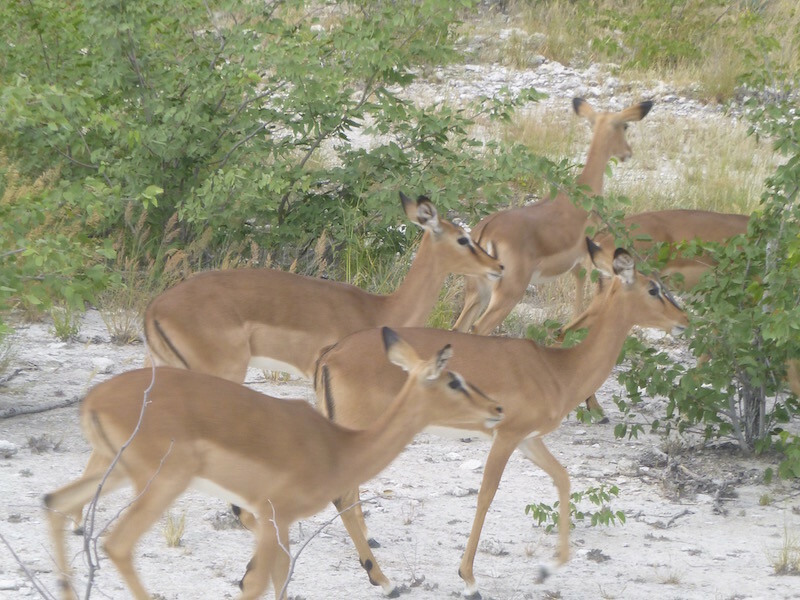 I didn’t encounter helpers at the Katima crossing earlier in the morning, nor did I encounter helpers when I got off the ferry in Botswana. 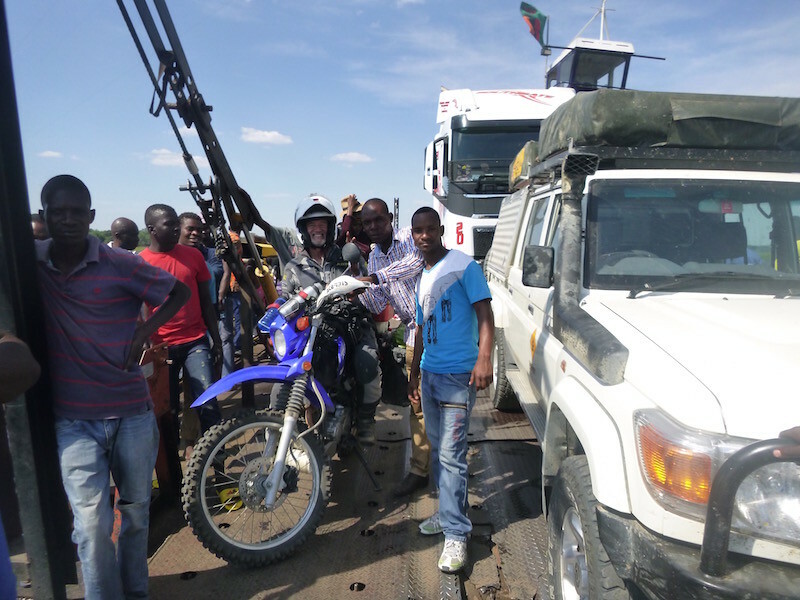 One big truck at a time at the Kazungula ferry crossing. With the ramps skimming and digging into the water during the crossing, I was a bit concerned. 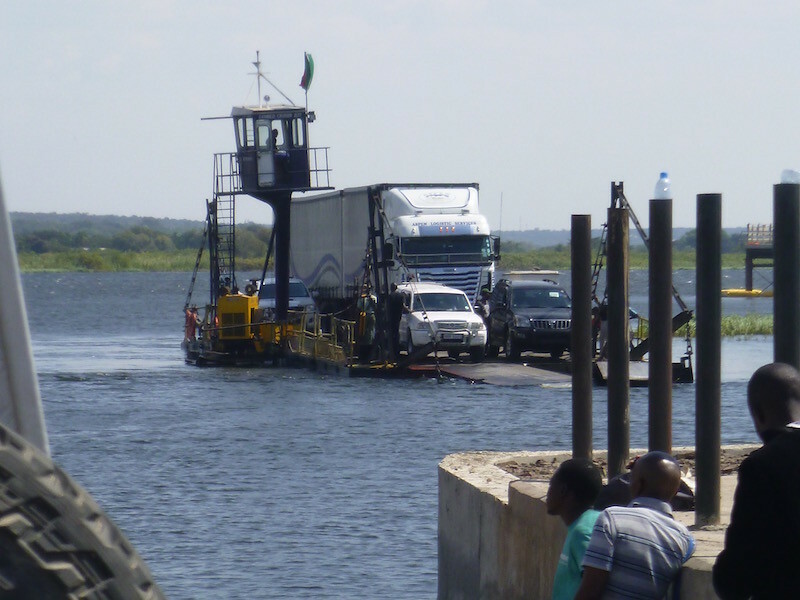 The reason there are so many trucks waiting to cross is because the ferry can only hold one truck at a time, and this is the official border crossing between Zambia and Botswana. 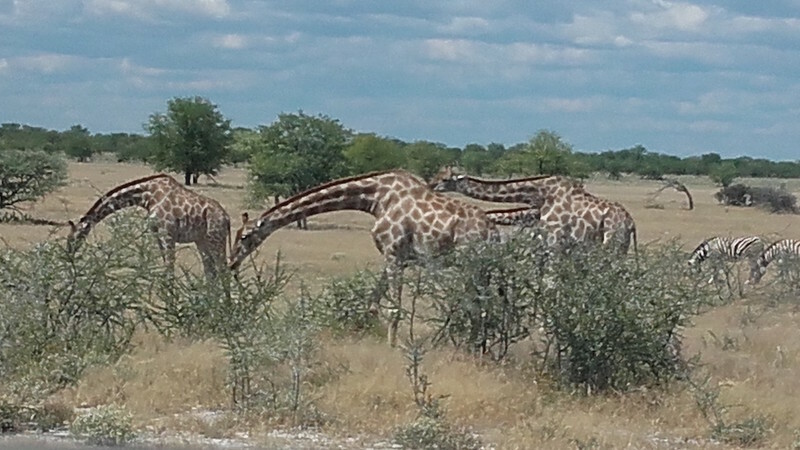 My carnet has very specific instructions stating that this is the only border crossing I can use to leave Botswana. 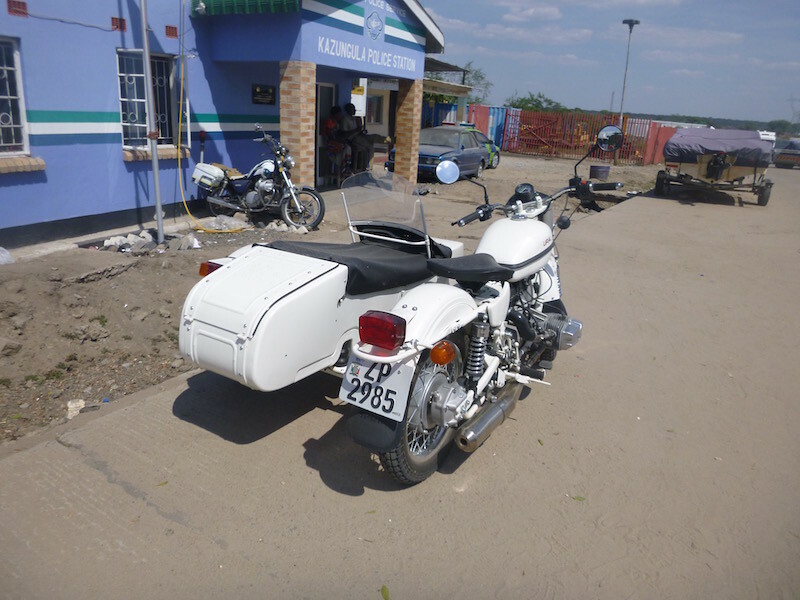 Official Zambian police vehicle at the Kazungula border crossing. One of the locals on the ferry pulled out his cell phone to take a photo of me, and suddenly everyone wanted to be in the picture, so I gave him my camera as well. 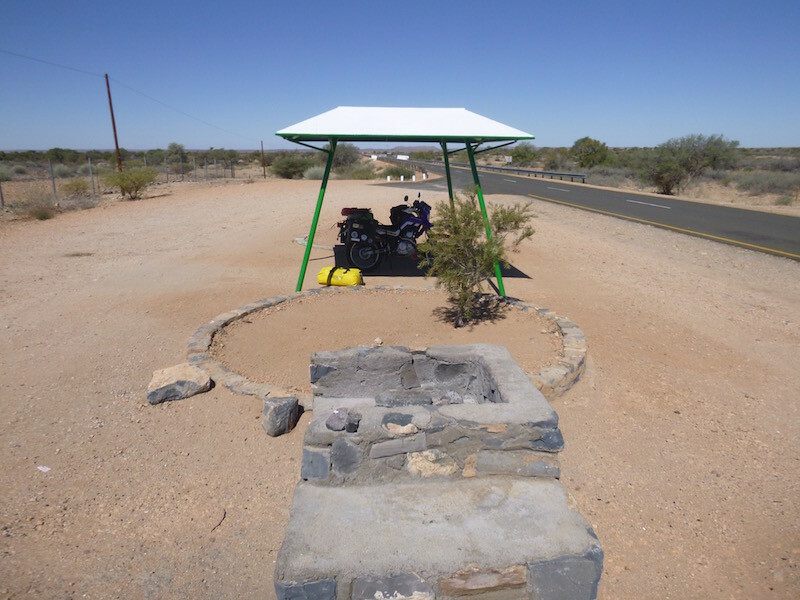 Four countries all come together near this point: Zambia, Namibia, Botswana, and Zimbabwe, kind of like the “Four Corners” in the US where Utah, Colorado, New Mexico, and Arizona all meet. But not as nicely square as that. 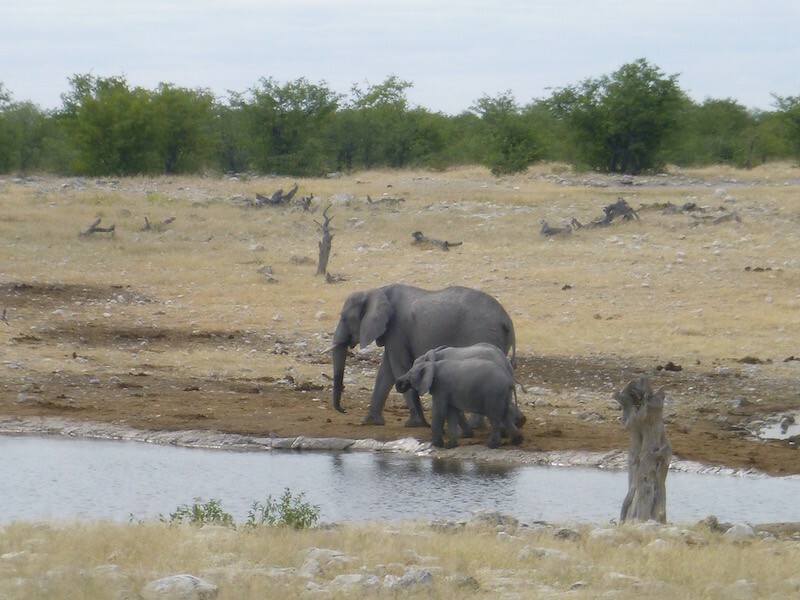 The entry into Botswana was very straightforward (and without all of the fees of Zambia) and I was through immigration and customs in about ten minutes and on my way to my camp for the next couple of nights. 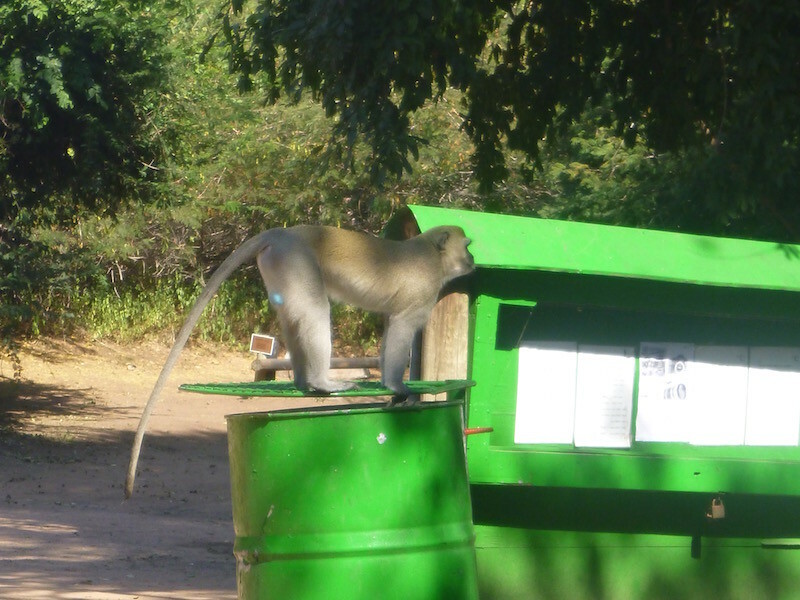 As I pulled into the camp, the guard at the gate told me to be aware of the monkeys and baboons. And she wasn’t kidding. 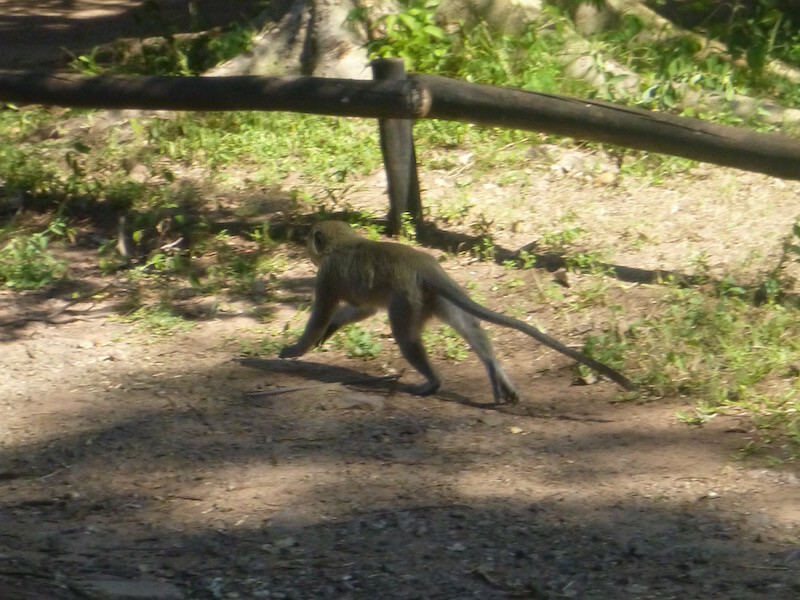 The monkeys were everywhere, as were warthogs. 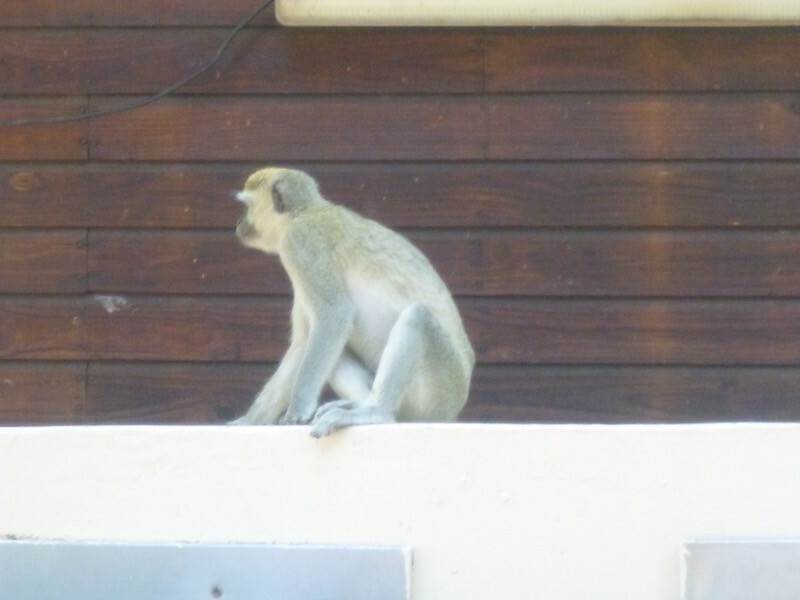 Before I could get the tent set up, I had a dozen monkeys in my campsite watching me. 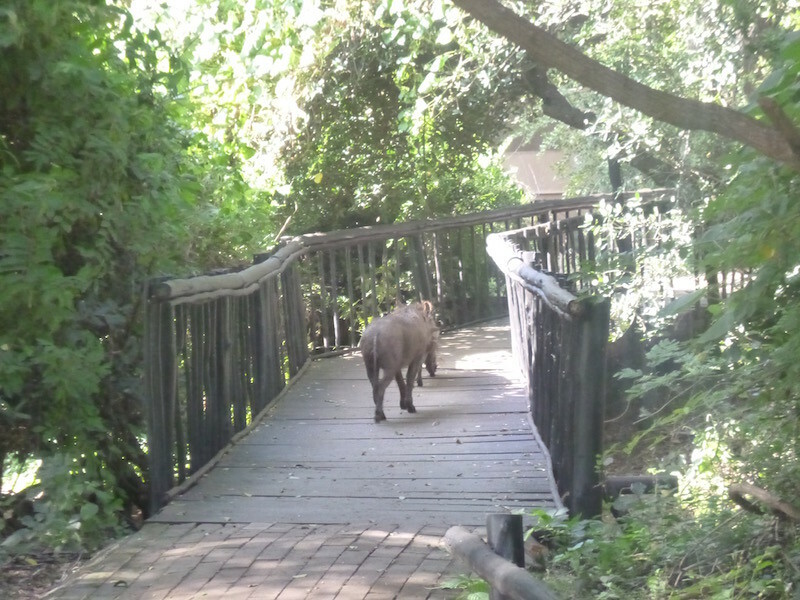 Haven’t met the baboons yet, but the warthogs are about as thick as the monkeys here. Windhoek, unfortunately, turned out to be what I had heard. The capitol of Namibia, it’s a big city, with a crime problem. I’m sure like most big cities, there are pockets of good and pockets of bad. I don’t think they put many hostels in the “good” sections. Outside the gate to my hostel was a sign that said “Do not leave your vehicle unattended on the street. It WILL be broken into.” Not “it MIGHT”. 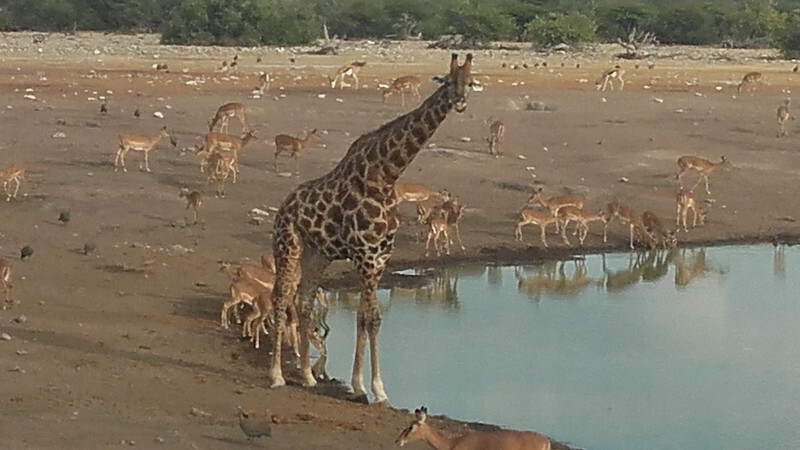 I spent two nights at the hostel; one before the safari tour to Etosha, and one upon returning. The first night someone left their rental car on the street briefly, and lost all of their stuff. The second night a woman had all of her luggage stolen, including her passport (I never heard the story of how, so I don’t know if it was in a car). In both cases, they were U.S. citizens. Not sure what that says, but the sign is fairly prominent. 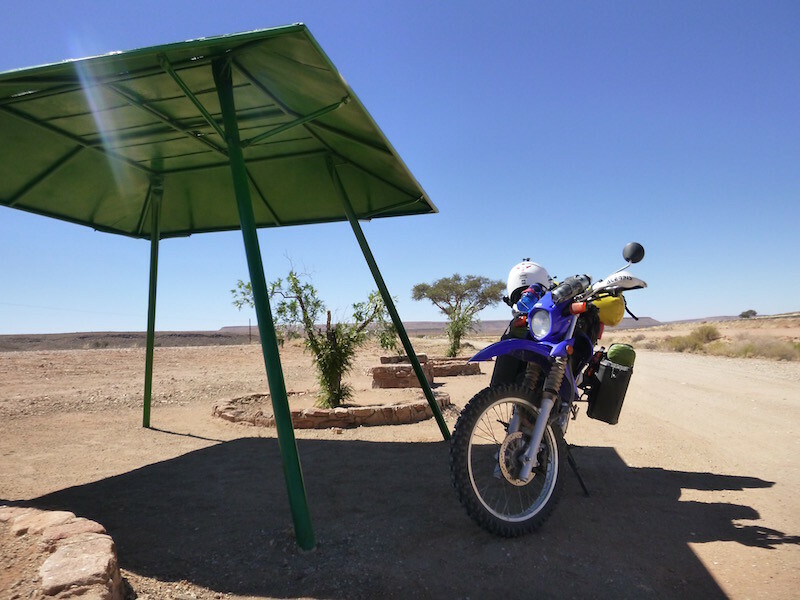 I left my bike inside the gate, with a cover on it, for the three days I was in Etosha, and was still worried about it, although all turned out fine. It’s a shame, because aside from Windhoek, my experiences in Namibia have been overwhelmingly positive, and the people have been great. Leaving Windhoek, I rode back up the same highway that I had just come down in the safari bus the day before, eventually turning away from Etosha on a road out of Otavi. 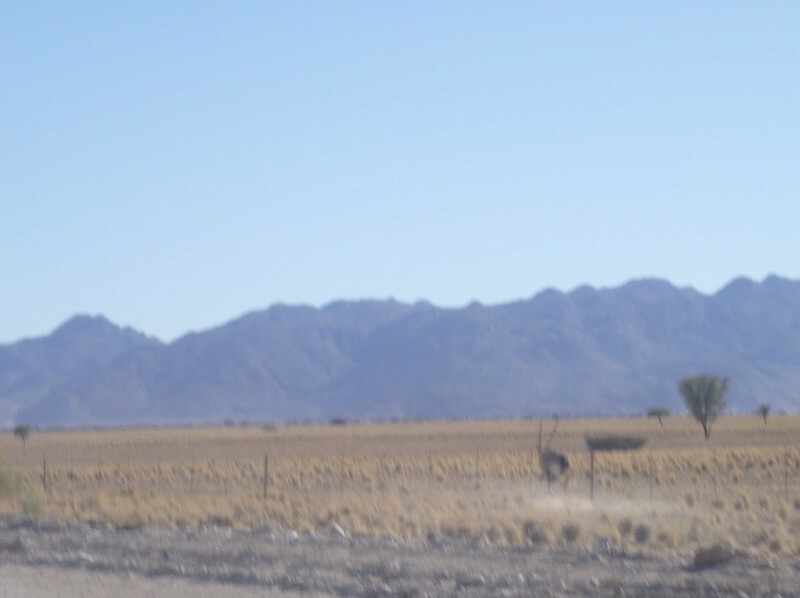 From there to Grootfontein I passed through a wide valley, which looked a lot like the Rio Grande Valley in Texas — large, flat, grassy plains and pastures with tall palm trees and cattle — except for the low mountains on the horizon. This would be my longest distance to cover in one day in Africa — around 515 kilometers or 318 miles — and fortunately it was all paved. 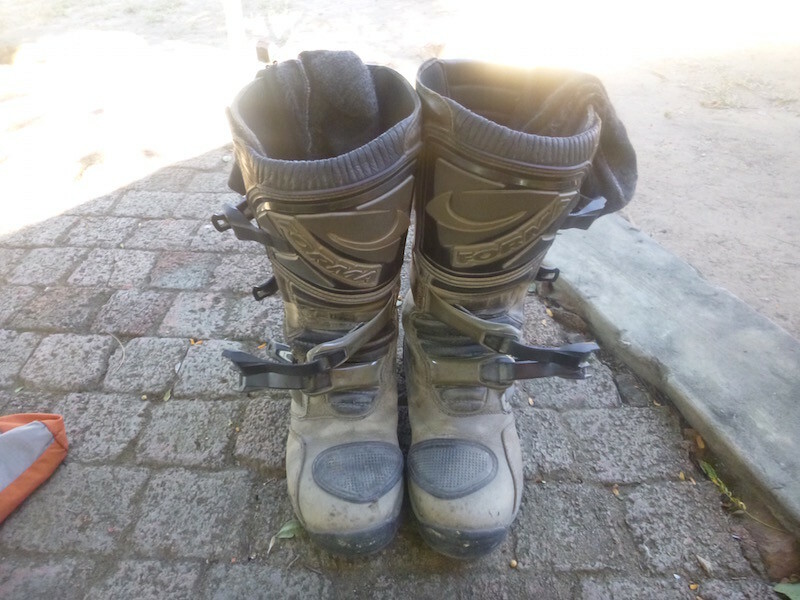 At a fuel stop along the way, I received the usual questions: “Where are you coming from?” (most people here initially assume I am South African, I guess because I am a white guy on a motorcycle), “How long have you been on the road?”, and “Where are you going?”. When I mentioned that I was from Texas, the response was “I see you have your cowboy shoes, but where is your hat?” The stereotypes of Texans are as strong or stronger than our stereotypes of Africa. 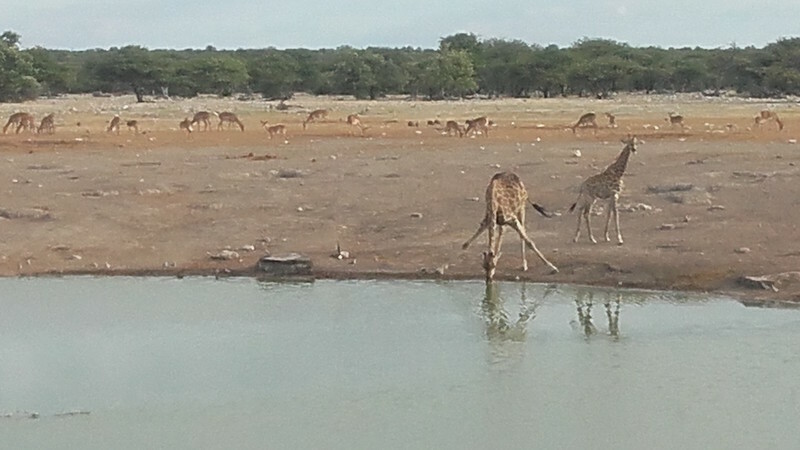 I spent the night at Roy’s Rest Camp just north of Grootfontein. At the campsite, I met Jeremy and his mum B, who are traveling together in a rented 4×4 camper truck, and having a great time. I’m still not sure I understood it exactly, but it sounded like Bea was from England but had been living in New Zealand for a long time, and Jeremy is from New Zealand, but has been living in London, working in IT. 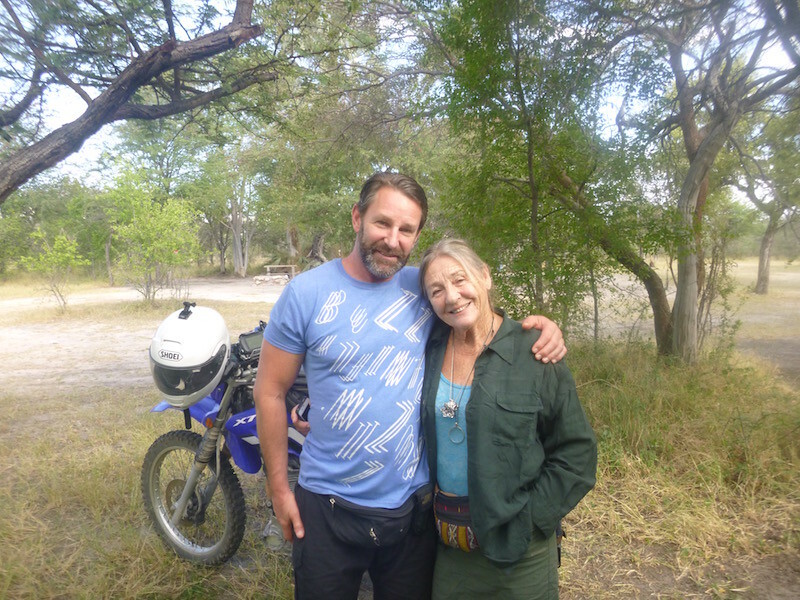 When he was recently “rendered redundant” as they call it (laid off), he decided to do this Africa trip, and chose his 76-year old mother as his navigator/traveling partner. I had dinner with them at the campground, and coffee the next morning, and they’re great people. B is a hoot. I’d choose her for a traveling partner too. Jeremy had lots of questions about my bike setup. He rides, and after meeting me, is seriously considering a long trip on a bike. I also met two gentlemen from Sedgefield, South Africa, who along with some friends started a craft brewery as a hobby after retirement and now can’t make enough beer to satisfy everyone’s demand for it. They recommended a camp site for the following night near Divundu, so I made a note of it and decided to try to track it down. Leaving Roy’s the next morning, the scenery began to look more like what I had always imagined Africa to be. 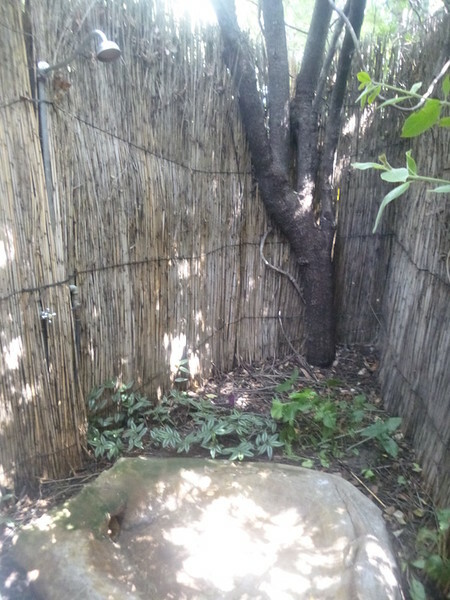 There were small huts, about 8 feet square, made from tree branches for walls and with thatched roofs. These homes were usually in a compound of six to ten of them, surrounded by a fence also made of tree branches. (I later learned not to call them “huts”. They are “local houses”. And the gathering of houses surrounded by a fence are the houses of extended family.) Occasionally a house made of corrugated sheet metal would appear in among the wooden houses (where does all of this corrugated sheet metal come from? ), and the inevitable plastic lawn chair. I have to think I’d be the richest man in the world if I could just get a few cents royalty from every plastic lawn chair sold. These women were grinding grain outside their family houses. I wouldn’t want to arm wrestle them. They’re using slightly smaller versions of utility poles and really slamming them into the grain. It was impressive. I would definitely say I was more impressed with them than they were with me. African version of Home Depot: everything you need to build your house, for sale on the side of the road. Women dressed in bright dresses walked down dirt paths alongside the road, carrying heavy sacks of grain, plastic jugs of water, or woven bowls on their heads, perfectly balanced, some with a baby in a sling on their back. Children waved eagerly as I rode by. Young men gave me the thumbs-up, while smiling broadly. By the end of the day, my left arm was tired from so much waving back. Eighty kilometers from Divundu I passed my first motorcycle traveler going the opposite direction on a yellow BMW GS. I slowed, but he didn’t, so I continued on. I didn’t see his license plate, so I’m not sure where he was from, but the bike was loaded similar to mine. 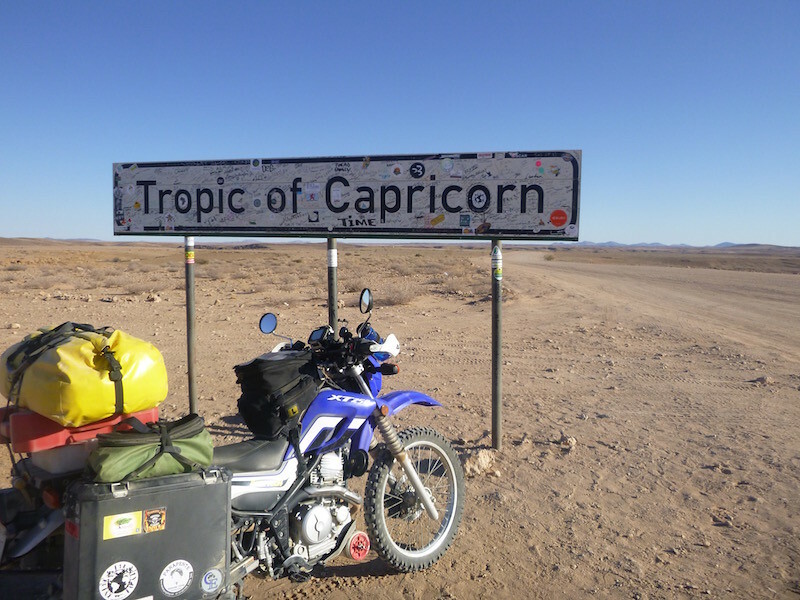 This is definitely not the Gringo Trail in South America; it’s been just over 3,500 miles in Africa, and that’s the first traveling motorcyclist I’ve seen on the road. Several miles down a gravel road, I found the Mobola lodge and campsite I had been told about. 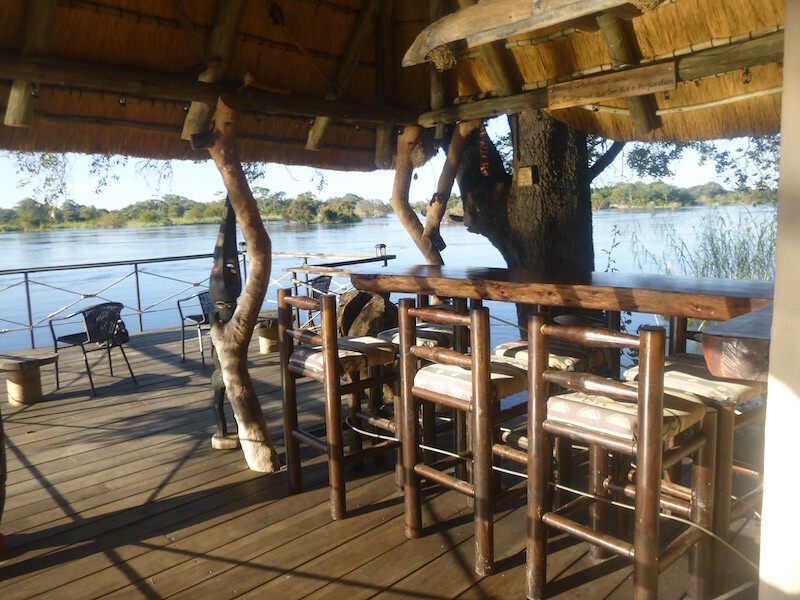 A nice place, right on the river, with a bar over the water to watch the hippos and crocodiles. 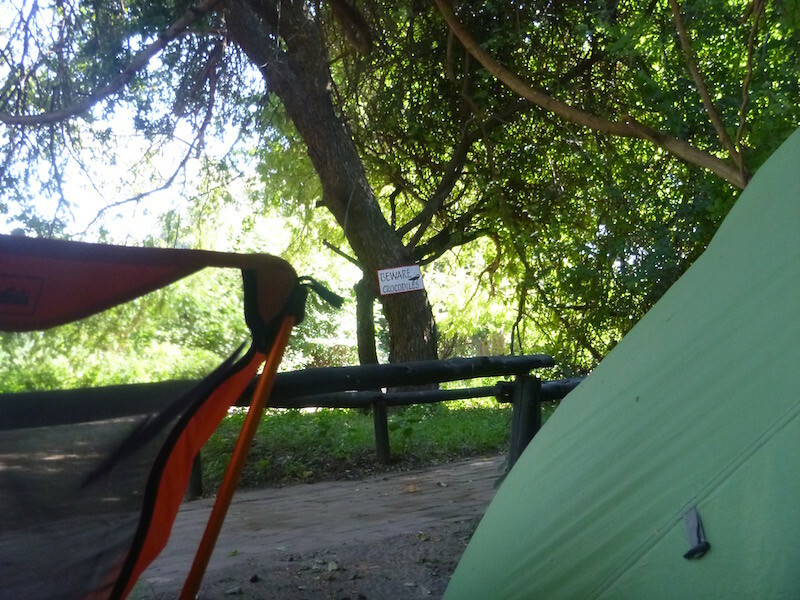 Overlooking the Okavango River from my campsite. Hippos were a bit noisy but didn’t bother me. 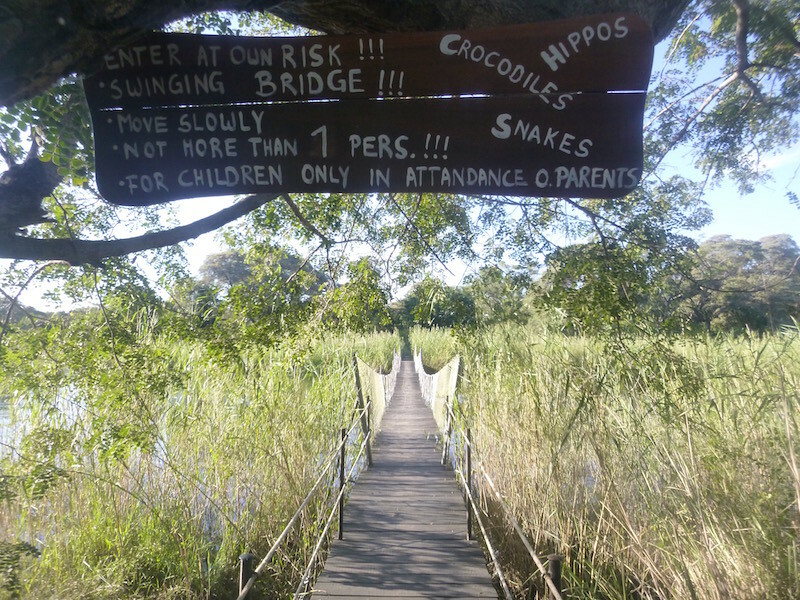 Tell me where in the U.S. you can have this: a swing bridge over a river filled with hippos and crocodiles, that leads to an island with a bar. 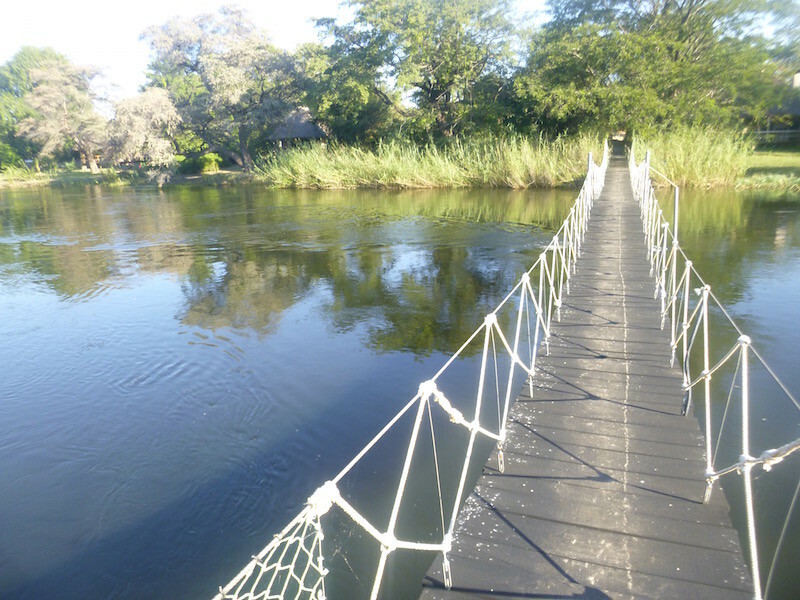 So after you’re done drinking, you have to sway back across the crocodile-infested waters, in the dark, on a swinging bridge. With great personal choices comes great personal responsibility. THIS is what I love about other countries. Bar on the island. Looking across the river to Angola. The next morning I packed up slowly, as I was only going about 25 miles to another riverside camp. This one I had read about earlier and had booked a reservation in advance, otherwise I would have gladly stayed at Mobola another night. Made it across, slowly. Not deep, but fast current, and rocky bottom. 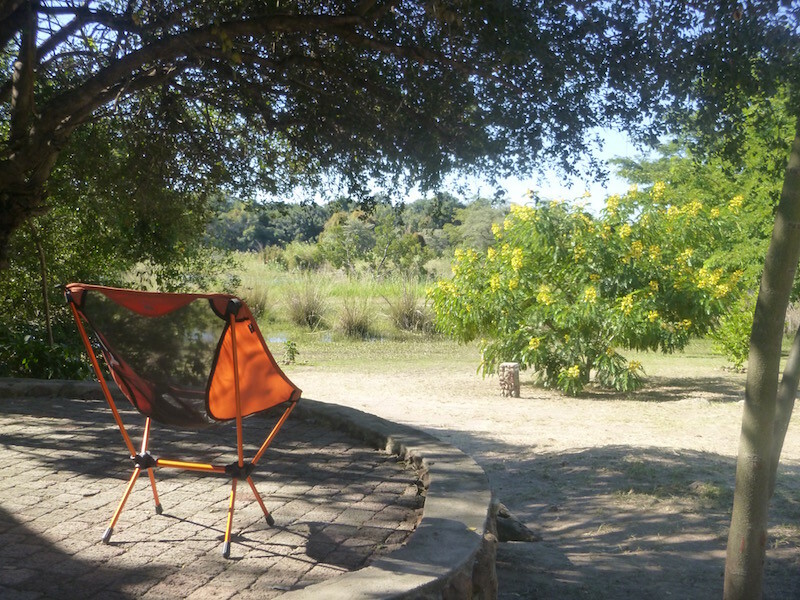 The camp itself is on the edge of the Cubango River; very green and lush. 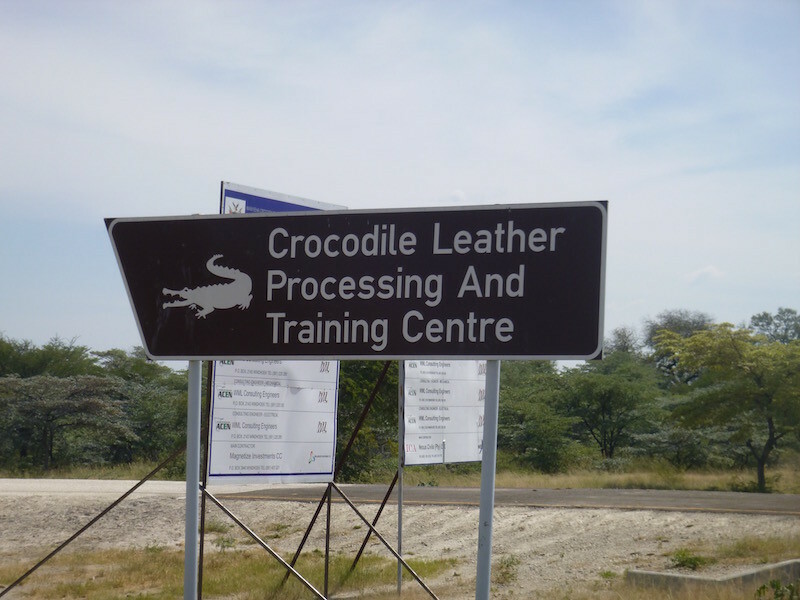 Which is probably why the crocodiles and hippos like it so much also. My campsite is right on the river. I’ve been assured that the animals won’t disturb me (or does that mean they attack quickly?). 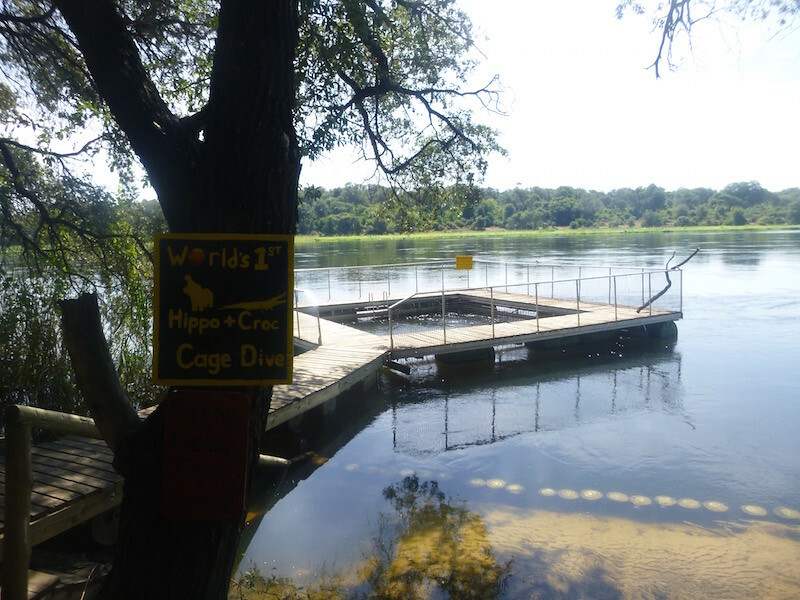 No kidding….this is the swimming pool: a cage in the middle of the river, so you can swim with the crocs and hippos. My campsite, on the river’s edge. Water heater for the showers. Wood-fired. Or elephant dung. Depending on what you’ve got more of. 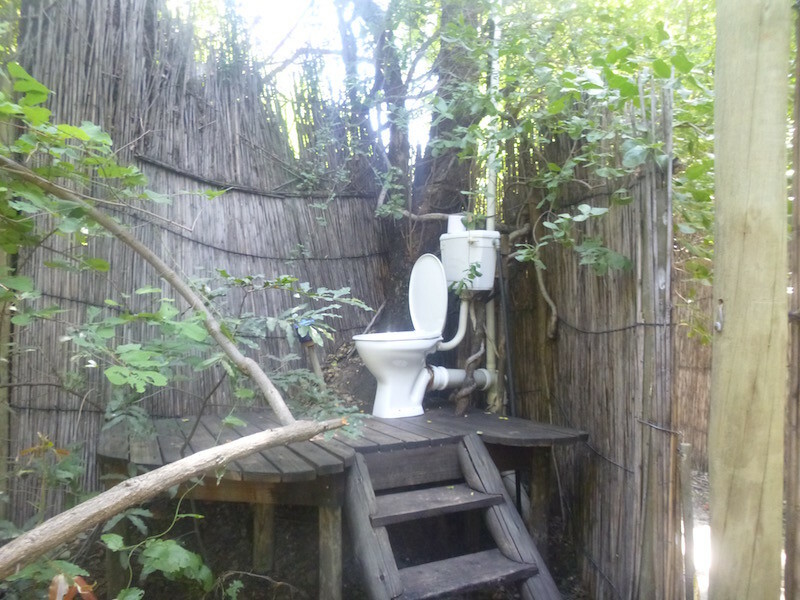 Yes, this is REALLY the toilet. And yes, I shot this photo from the jungle. There is no screen on this side; only on the side facing the campsites. 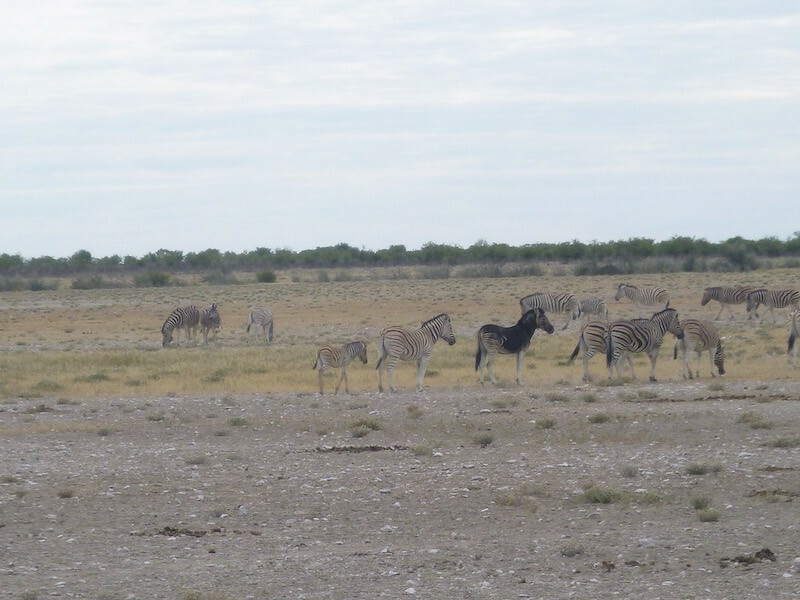 Etosha National Park was founded in 1907, and covers about 8,600 square miles, or a little larger than the state of New Jersey. 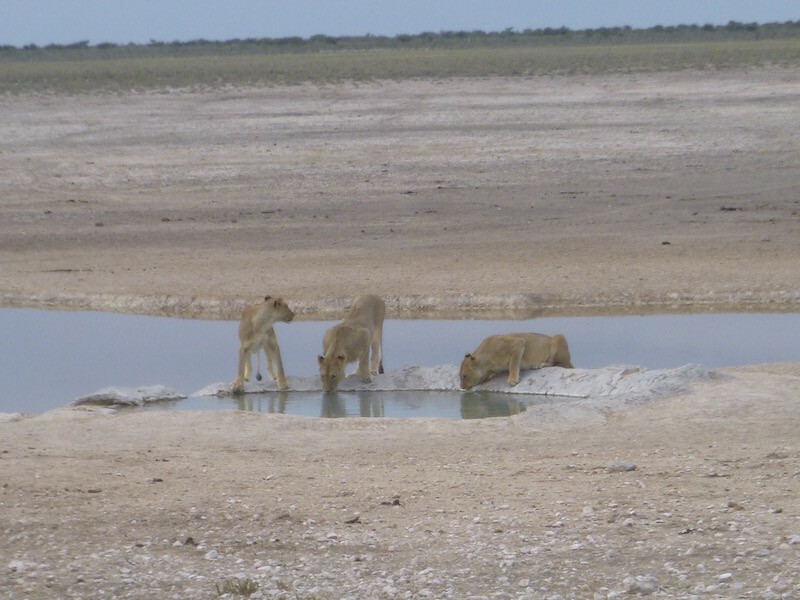 It is known for the Etosha Pan, or dry salt lake, which is 75 miles long. 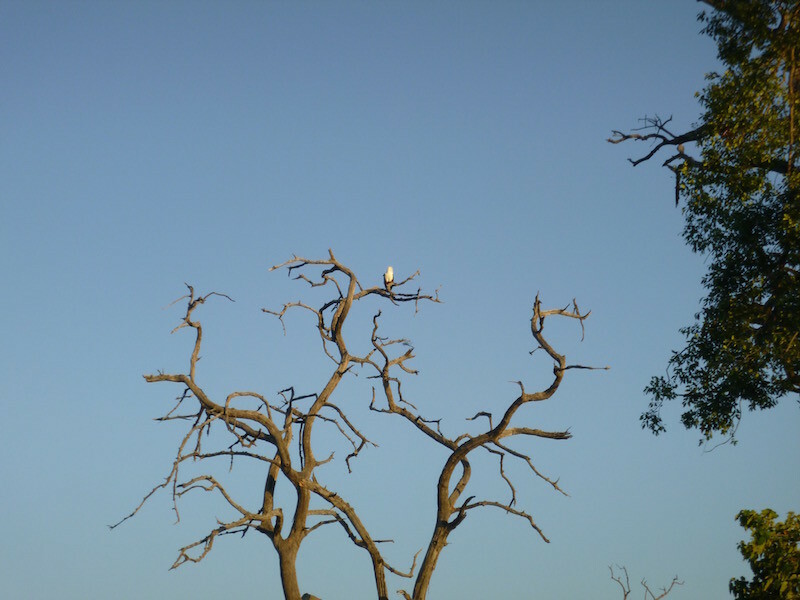 It’s also known as one of the best places in Southern Africa to see wildlife. 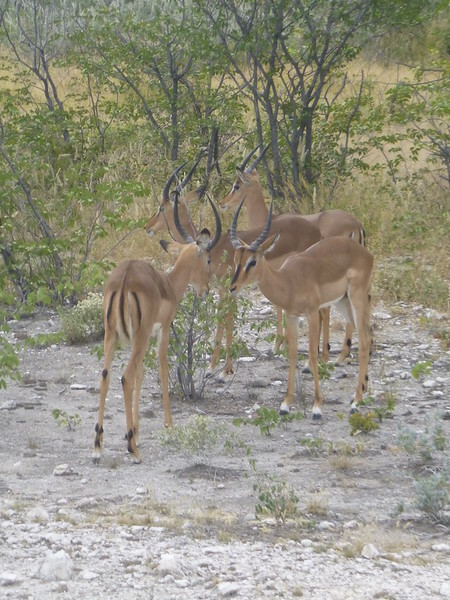 Of the “Big Five” game animals, Etosha has four of them, missing only the buffalo. 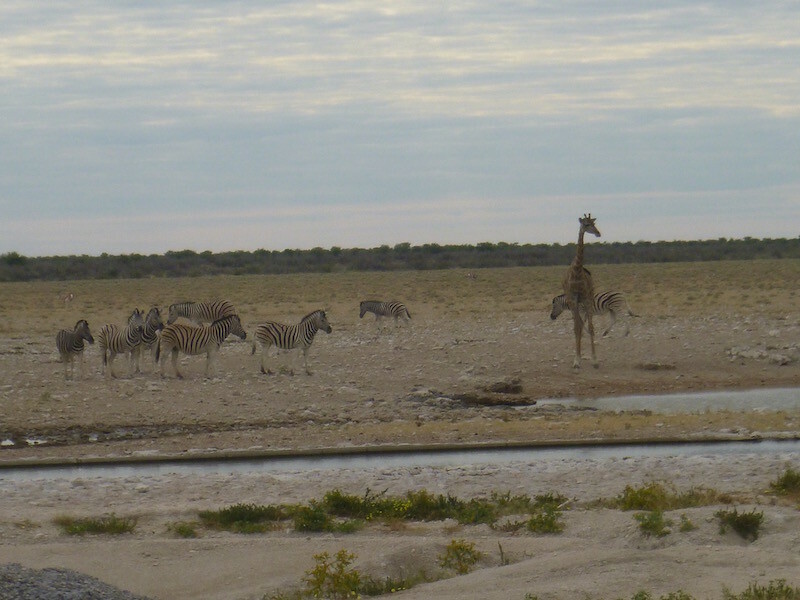 I spent the last three days on an organized safari tour of Etosha National Park. 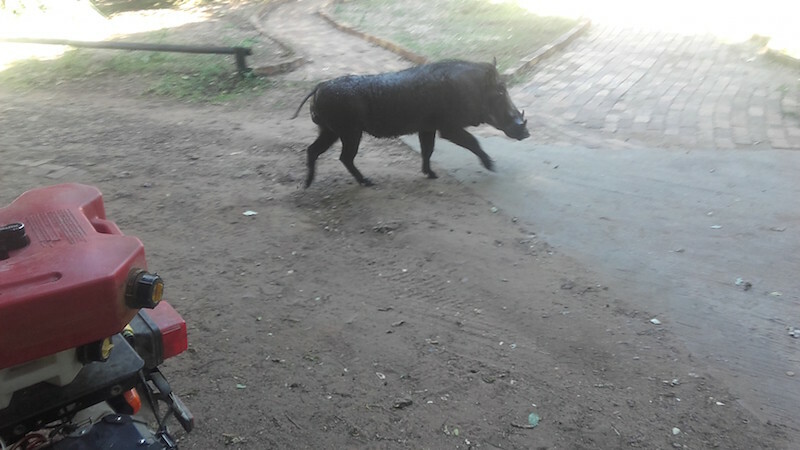 This was necessary due to the restrictions of most game parks in Africa prohibiting motorcycles (which is probably a good thing, as it only takes one near-sighted lion to mistake me and my XT for an impala or a kudu, both of which probably have better acceleration than the XT and still lose out to the lion). 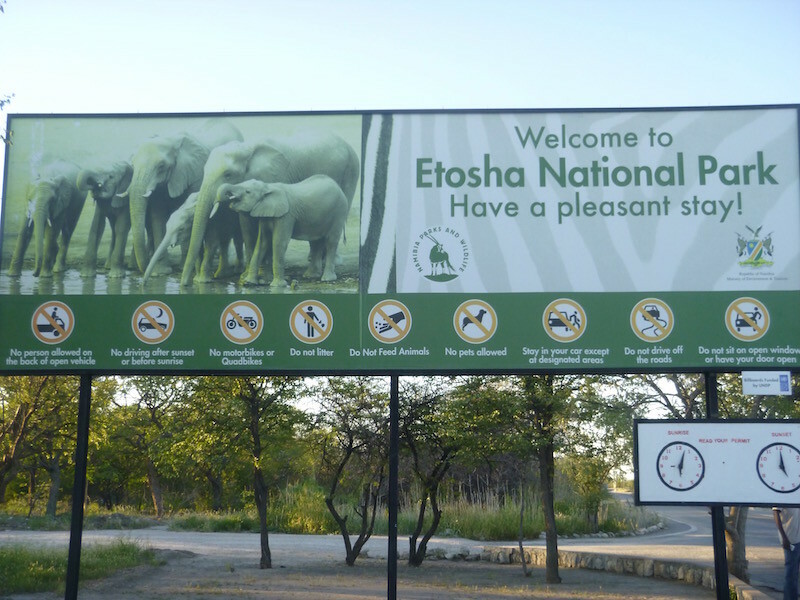 You’ll notice the 3rd “No” symbol from the left at the bottom of the Welcome to Etosha sign says no motorbikes or quadbikes. 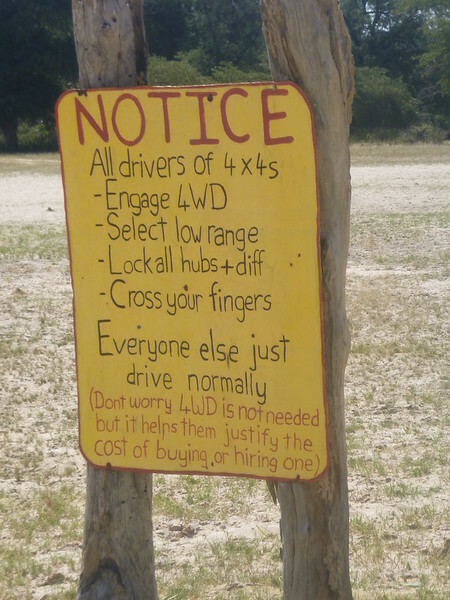 Thus, I spent three days in a safari truck. The 4×4 truck looks a bit like a cross between a box van and a bus, and carries 15 passengers and two guides. It was full for my trip; I was the only American, along with 9 Germans, two Dutch, a Thai woman and a couple from Singapore. 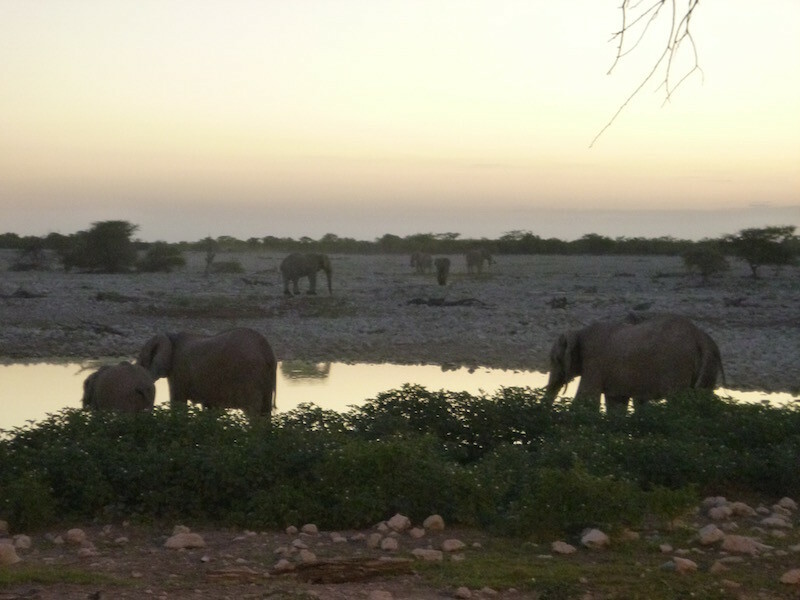 I was picked up at my hostel in Windhoek Saturday morning, and we drove nearly nine hours, arriving at the southern entrance to Etosha just before dark, where we immediately set up camp and walked to a nearby watering hole to watch elephants at sunset. 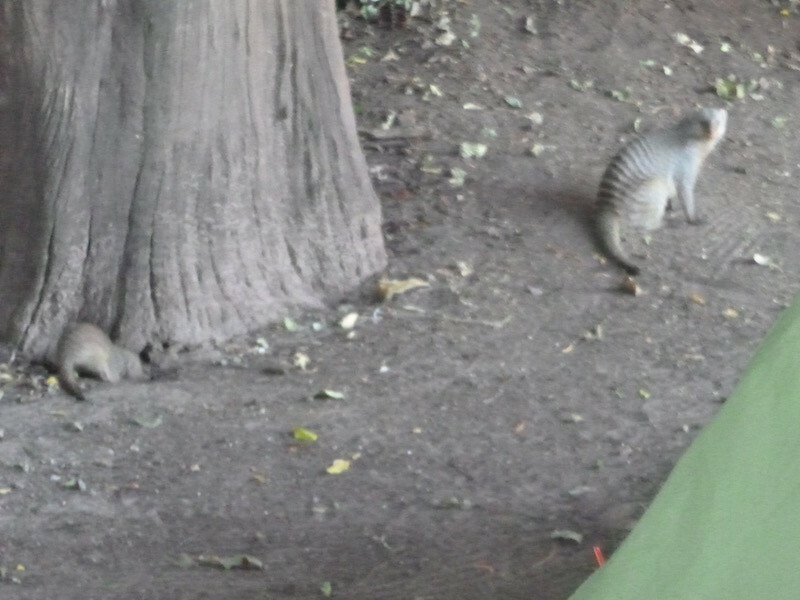 Not something I want to wake up to in my tent during the night…. 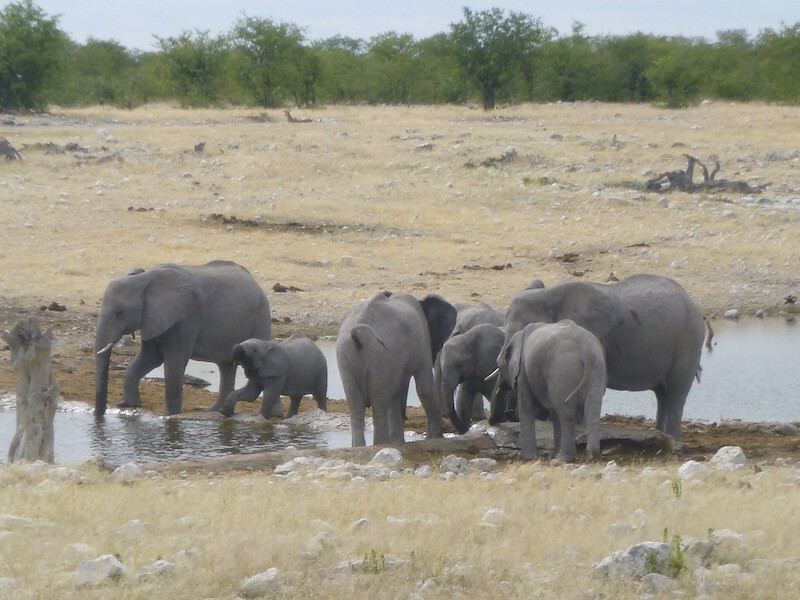 The next morning we packed up and spent the full day driving across Etosha, stopping at various watering holes and along the road to observe the wildlife. I’ll let the photos tell the story of the day. 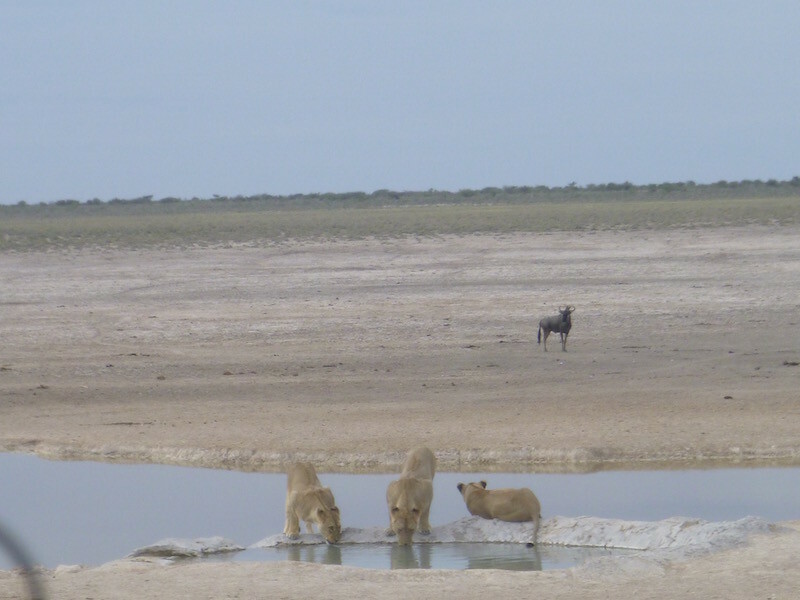 Three lionesses at a watering hole. 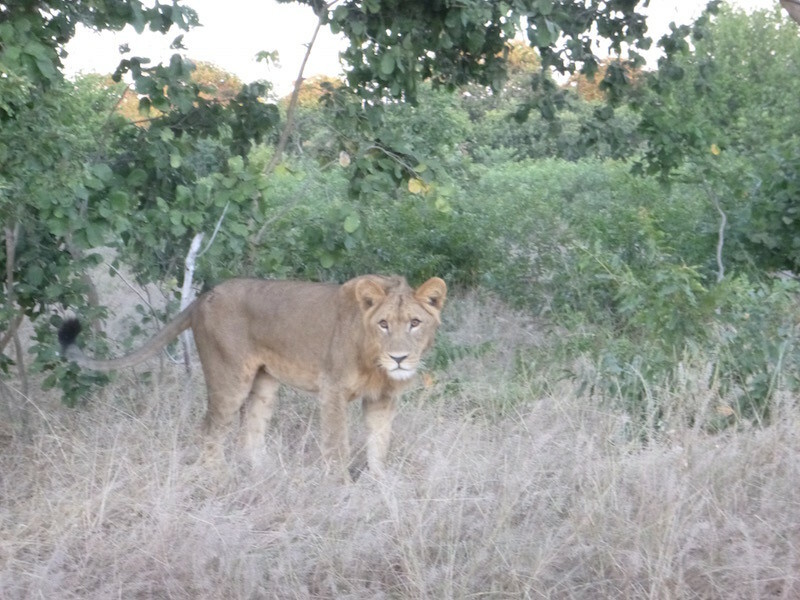 A gnu (wildebeest) came along, but spotted the lions and kept his distance. 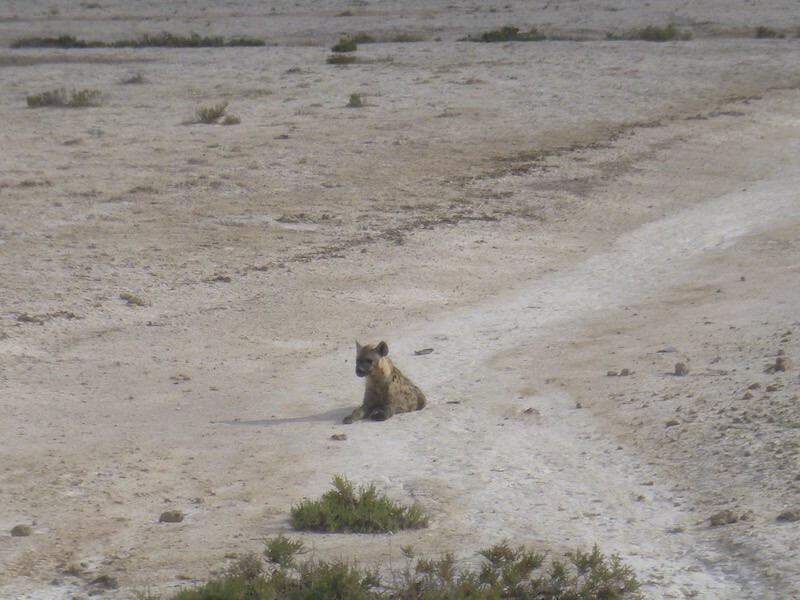 Spotted hyena lying in the riverbed. This one zebra looked like some of the problems I’ve had with the copier at work. He’s considered an albino zebra, even though he’s mostly black. 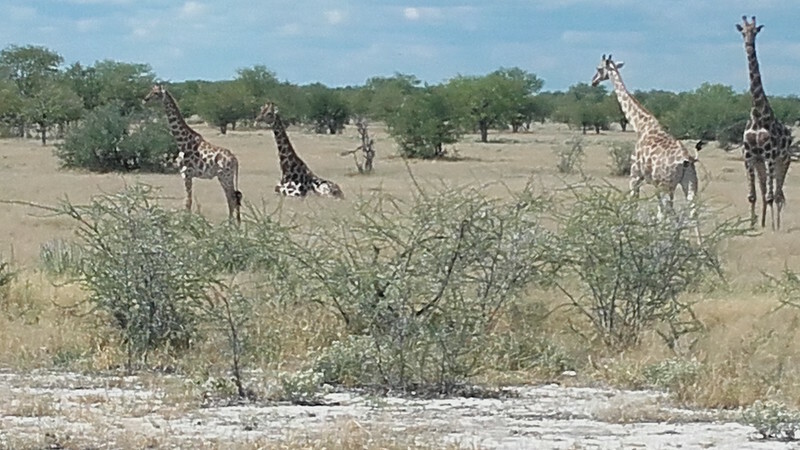 I liked this shot because of the one giraffe sitting down. 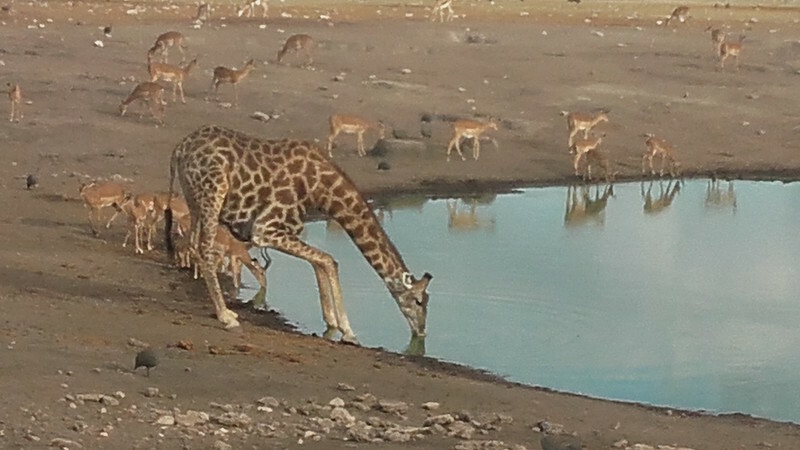 When your mouth is 15 feet off the ground, it takes some work to get a drink. These guys have two methods that I saw…the more graceful kneeling method as shown here. And the less graceful “splits”. Then there was the really wild animal at lunch. 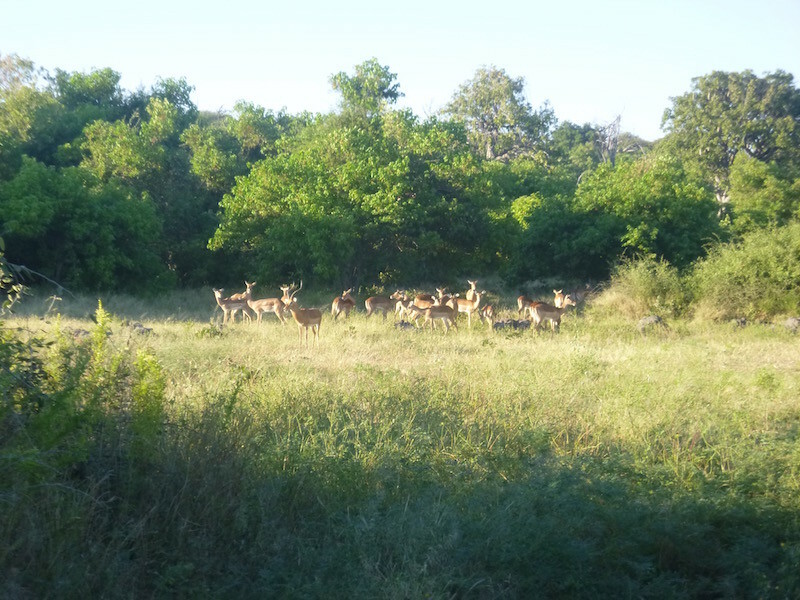 And the even more wild animals at breakfast. This British family spent the last seven months driving south from England. When they get to Cape Town they plan to sell the 4×4 and fly home. I walked up and said to Dad, “Your kids are so cute. Can I take their photo?” and he said, “You can take the kids.” Seven months in a camper will do that to you. Blurry photo. 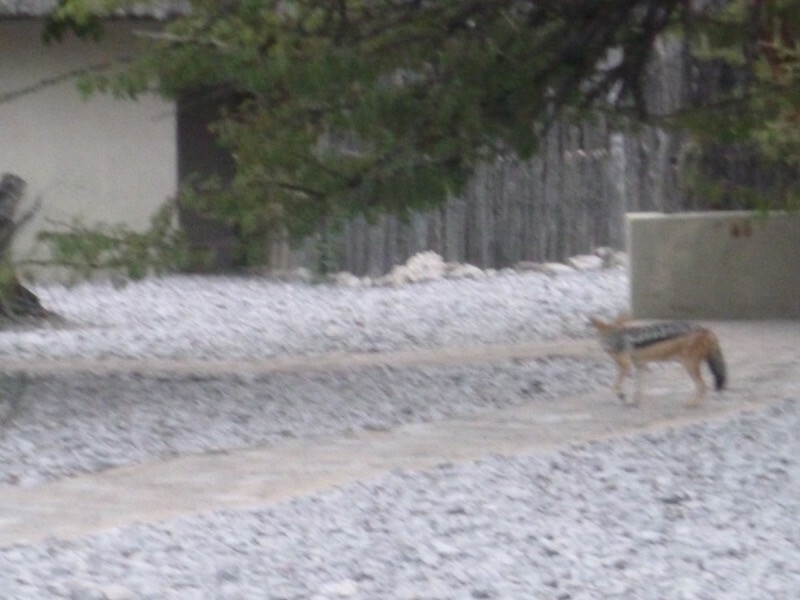 These jackals were always around the camp sites. They were skittish, but would walk right into camp and up to the table looking for food. Clearly people had been feeding them. It was a long three days of driving (or riding along in a truck actually), but worth it for the scenery. Although I found myself thinking that as anti-social as I was before I left on this trip, I’ve become even more so now that I’ve been traveling alone for so long. It was difficult to travel with a group, and I’m ready to get back on the bike and ride and camp alone again. One nice side effect of the past several days has been the total lack of access to the outside world. It was nice to have no wifi, no cell service, no connection whatsoever, and not be concerned with responding to the expectations of others via email, etc. For the first time in eight months of what I expected to be a remote, somewhat isolated adventure, I finally found that isolation. While the world has become a much smaller place with wifi and cellular, it comes at the price of peace and serenity. It took Africa to show me that it can still exist. And that concludes my anti-social rant for today. For those who came to this blog late, or just want to see the photos without all the blah blah blah, I put together a number of my favorite photos from the past eight months into a YouTube video. It’s dark, and I’m walking in a deserted town. It seems like they roll the sidewalks up around 6pm. Very few people out, yet it’s quite safe. The streets have very wide sidewalks which are paved with paving stones, mostly in a herringbone pattern, and done very nicely. And they are very clean. It struck me that there are two huge differences between walking through a town in Namibia and walking through a similar sized town in Latin America: first, the town is clean. There is no trash lying around, and no dog poop all over the sidewalks. Second, there are no dogs, or very few. 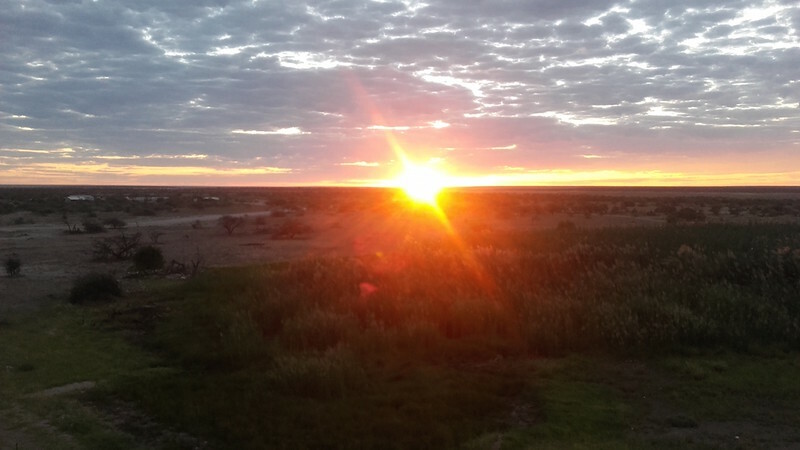 I walked for a couple of hours in Swakopmund two nights, and again one day, and I never heard a single dog bark. In Latin America, you would be unable to differentiate one dog barking from the literally hundreds that you hear at all hours. Maybe it’s the heat. Maybe it’s the sand. 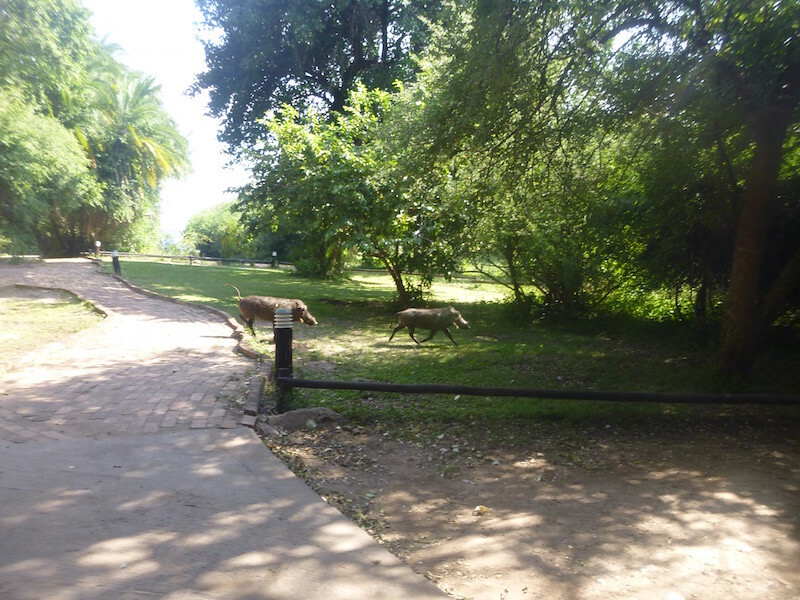 Whatever it is, there aren’t stray dogs running everywhere, and you see very, very few dogs at residences. The silence at night was surprising, after hearing so many dogs each night in Latin America. I can’t say for certain what the racial situation is in Namibia, but as a tourist passing through, it doesn’t feel as tense or stressful as it did in South Africa. People here seem to get along quite well, and are friendly. 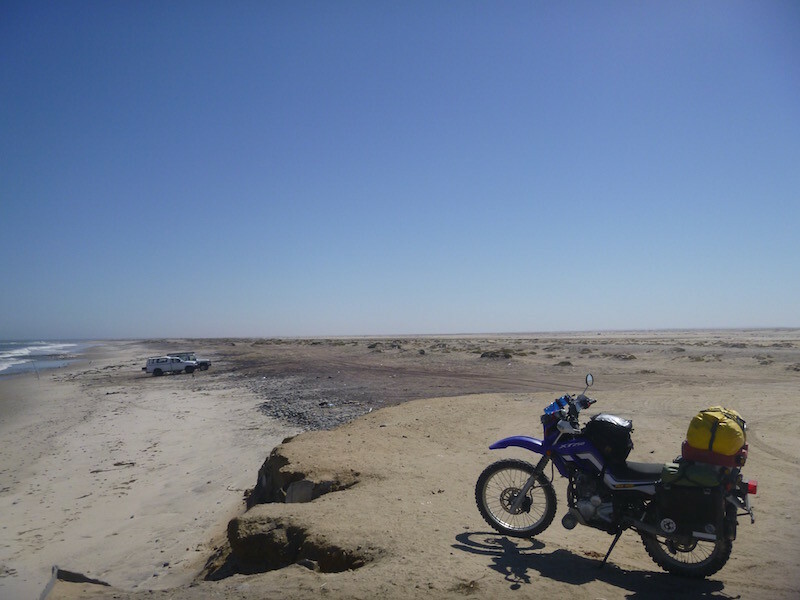 I left Swakopmund and headed up the coast to Henties Bay. 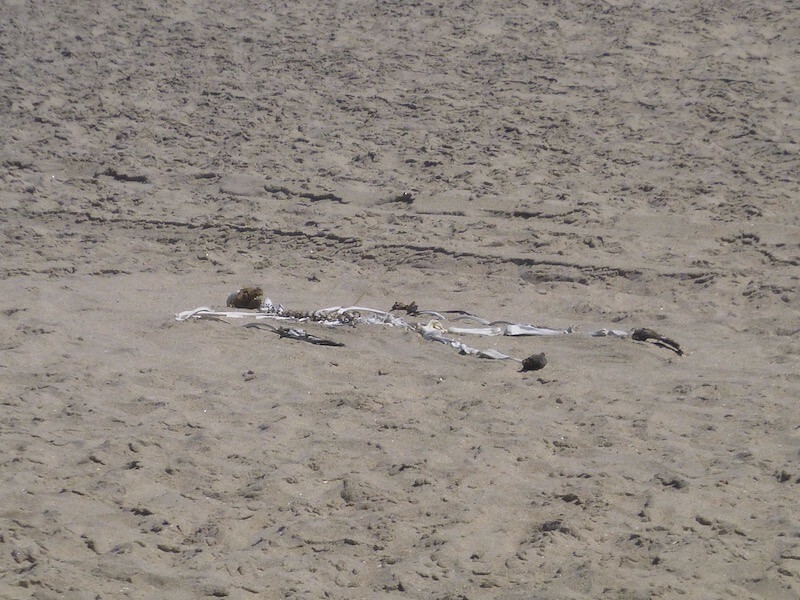 There is a reason why this is called the Skeleton Coast. And that’s not it. Actually, the term “Skeleton Coast” was first used by author James Henry Marsh as the title for his 1944 book about the shipwreck of the Dunedin Star cargo liner. Since then, the name has stuck, and it’s even used officially on maps today. The coastline between Swakopmund and Henties Bay is like most of the Namib coast, I think. 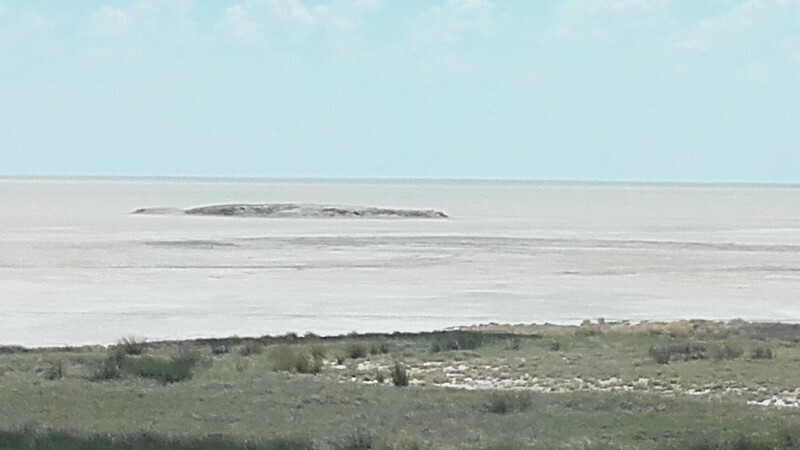 Desert flows all the way down to the sea. There are occasional communities or sometimes sole shacks between the highway and the beach. If not for these small settlements, there would be nothing man-made in sight except for the ribbon of unmarked asphalt road. South of Swakopmund is a community called Langstrand, which is the first indication on my route that there are people with money in Namibia. Langstrand looks like a high-end beach community in California, with beautiful one- and two-story stucco homes with large windows looking out on the ocean in one direction and on continuous desert in the other. 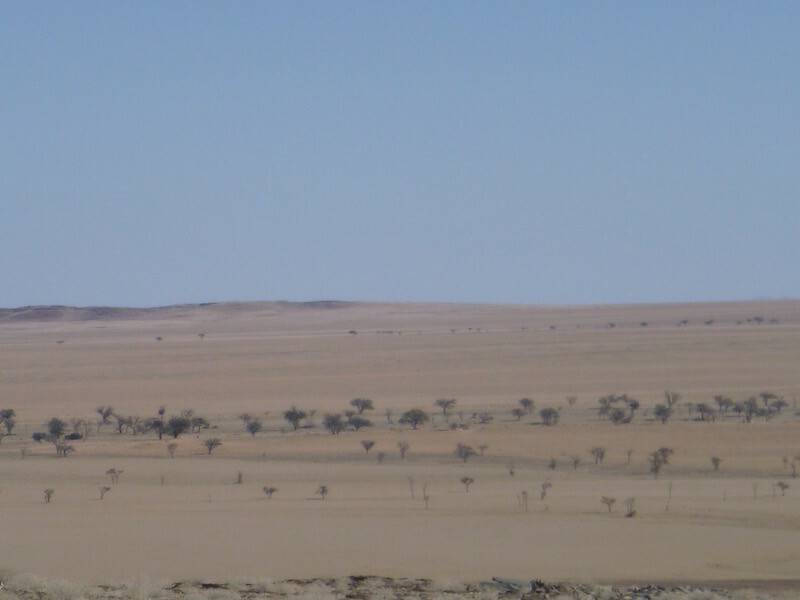 North of Swakopmund, there is not much of anything for the sixty or so miles to Henties Bay. Just desert as far as the eye can see. And a beach used only by a few fishermen. 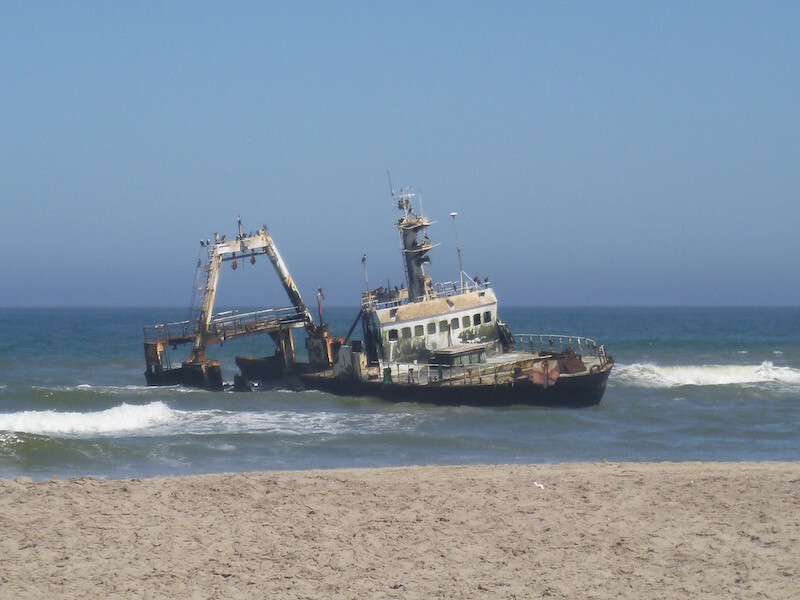 The Zeila fishing trawler, shipwrecked on the Skeleton Coast south of Henties Bay. 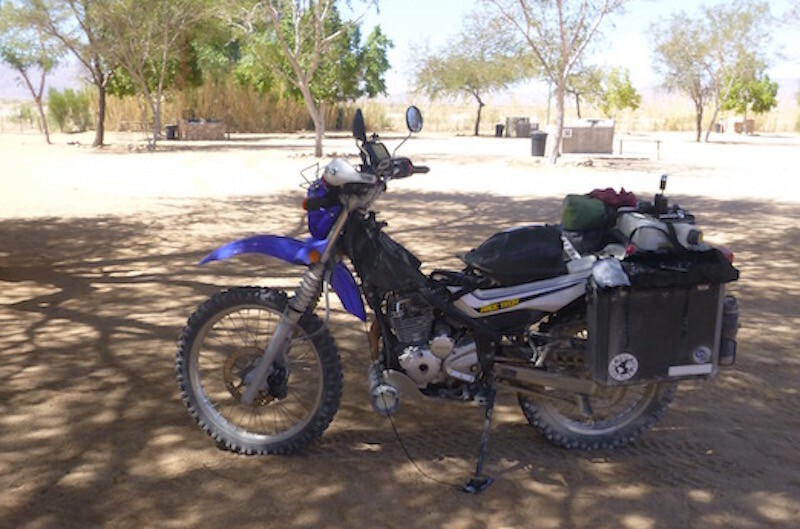 At Henties Bay, I turned east onto a gravel and sand road for another 76 miles until I reached the small village of Uis, near Brandberg Mountain, which is the highest spot in Namibia at 8,550 feet. I spent the night at Brandberg Rest Camp. Two fo the residents here are parrots, and they hang out on the patio near the swimming pool. They are quite entertaining. One makes the sound of a car alarm going off, while the other says “Warning!” at the same time. As the cat walked by, one of them taunted the cat, saying “Meeeeoooow”. They also whistle several tunes, including the military whistling march tune. I didn’t bother to take photos along this stretch from Henties Bay all the way to Windhoek, as quite honestly, there wasn’t much to see. If you’ve spent much time in the Mojave Desert in Southern California, then you’ve seen it. Oh. No problem then. I made sure the tent was zipped up tight that night. 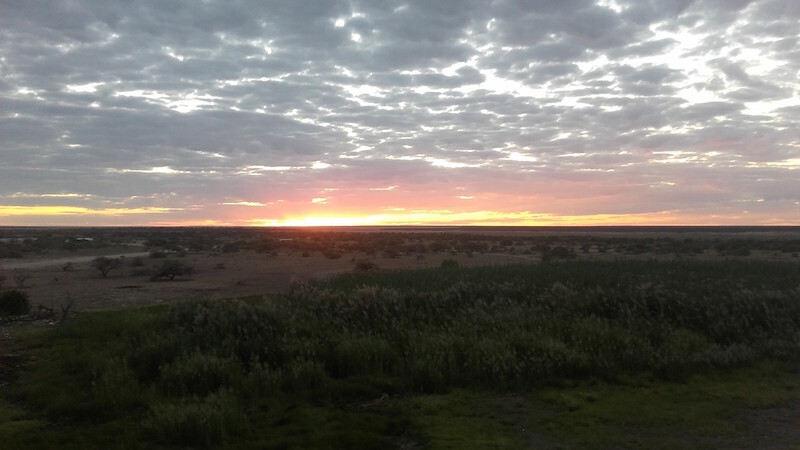 Getting on the road at sunrise or shortly after has a lot of advantages in Africa. Mostly, it’s much cooler, but there are also less vehicles on the road, so less dust. 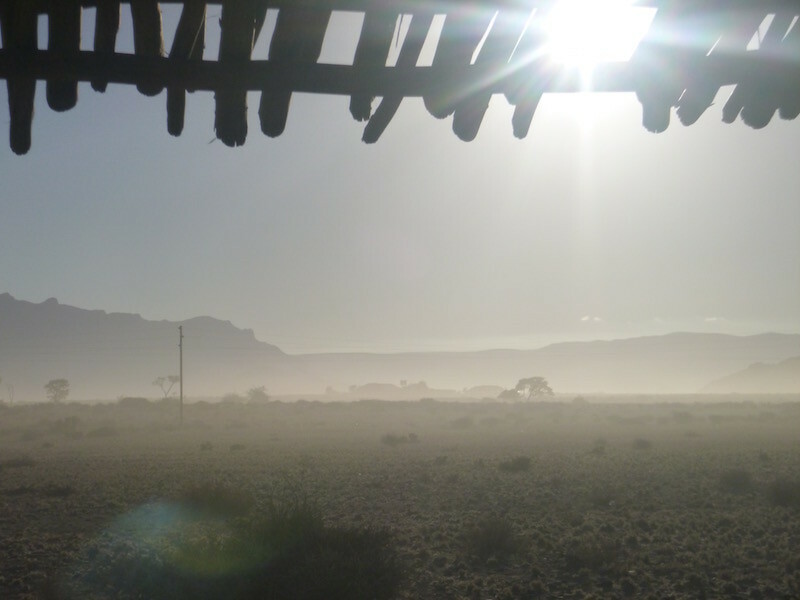 That’s not fog…that’s the dust from one truck. One disadvantage to being on the road early is that it’s cooler. Yep, it cuts both ways. The problem with being on the road when it’s cooler is that all of the animals are on the road then too. This oryx is larger than a horse, and weighs a lot more. 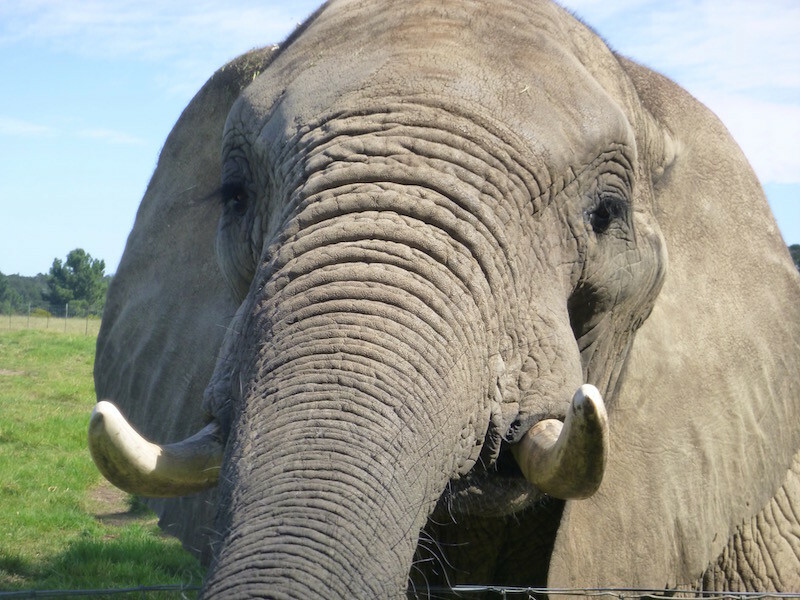 When they are standing on the road or next to the road and get spooked, they usually — and I say usually, not always — run for the side, and often run through the fence. They don’t try to jump it, they just put their head down and plow through the fence. It’s painful to watch. I slow way down around these guys. I left Sesriem early even though I was only going 53 miles today. I arrived at Solitaire around 8:30am, and it was still relatively cool. 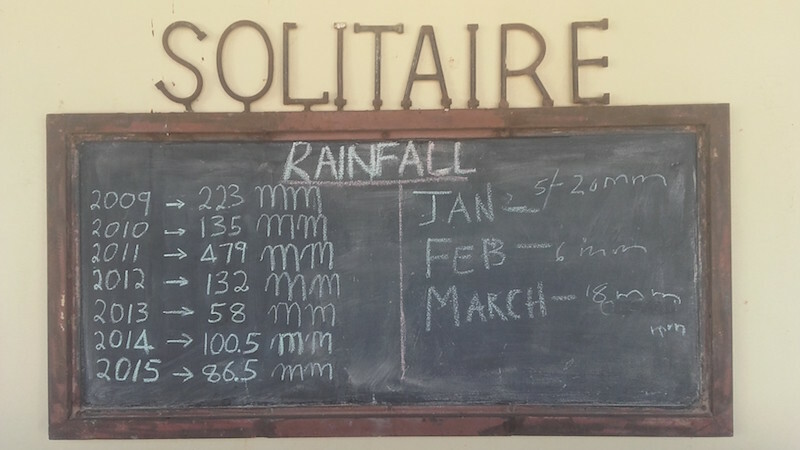 Official rain gauge in Solitaire. I found a campsite and had breakfast. Before the day got too hot, I decided to check the valve clearances on the bike while I had some shade and could let the bike cool down (another relative term). Valve clearances were right where I set them in Panama, nearly 15,000 miles ago. I just happened to arrive at Solitaire on the perfect day. It seems that the owners were throwing a party for all of their staff this night, with a big buffet dinner, and they invited me to join them. 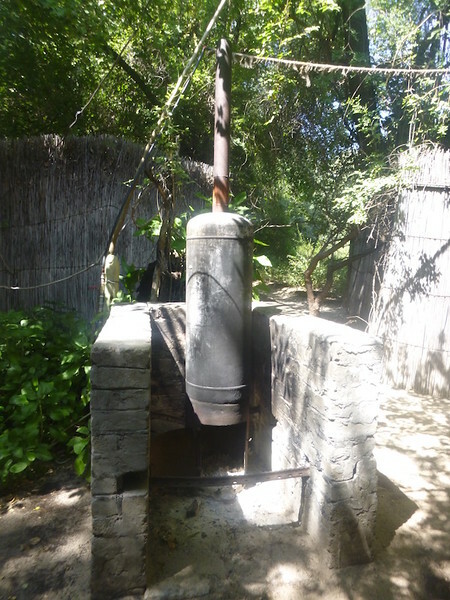 It was a great meal, and my first potjiekos, which is a southern Africa traditional stew cooked in an iron pot. Sunset in Solitaire with the moon high in the sky. 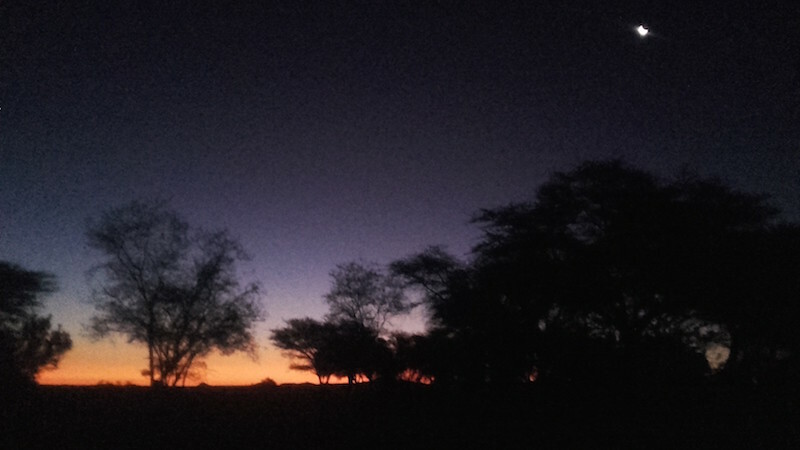 In the morning I again packed up early and set off for Swakopmund, which my gps said was 169 miles away, with the last 23 miles from Walvis Bay north being paved. The gravel on this road was better than the previous two days. This is a well traveled road, but I only saw four cars in 150 miles. 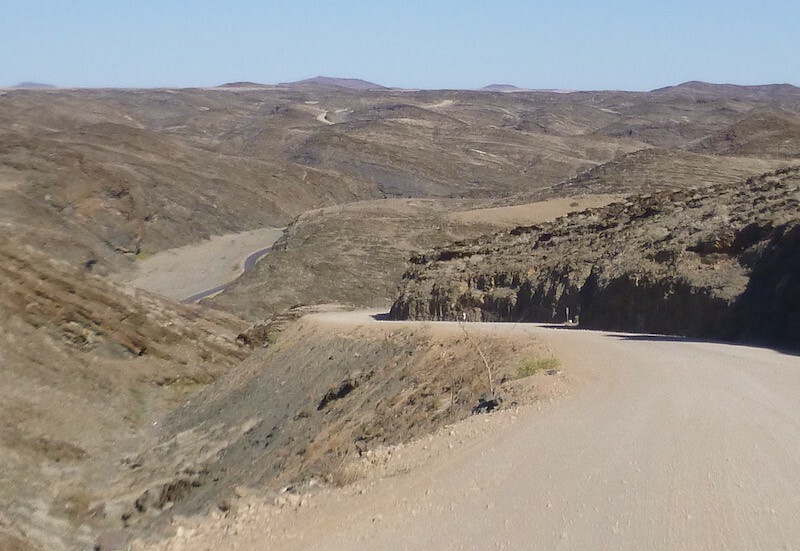 There were two “passes” on the road to Walvisbaai (Walvis Bay). After cresting this one, as I was heading down, I noticed beautiful pavement at the bottom. I’ve learned to be skeptical after Ruta 40 in Argentina. Sure enough, the pavement was 1 kilometer long, then went back to gravel. Why this one kilometer was paved, in the middle of nowhere, I have no idea. Yes, that is a 2RideTheGlobe.com sticker in the middle of the last “o”. 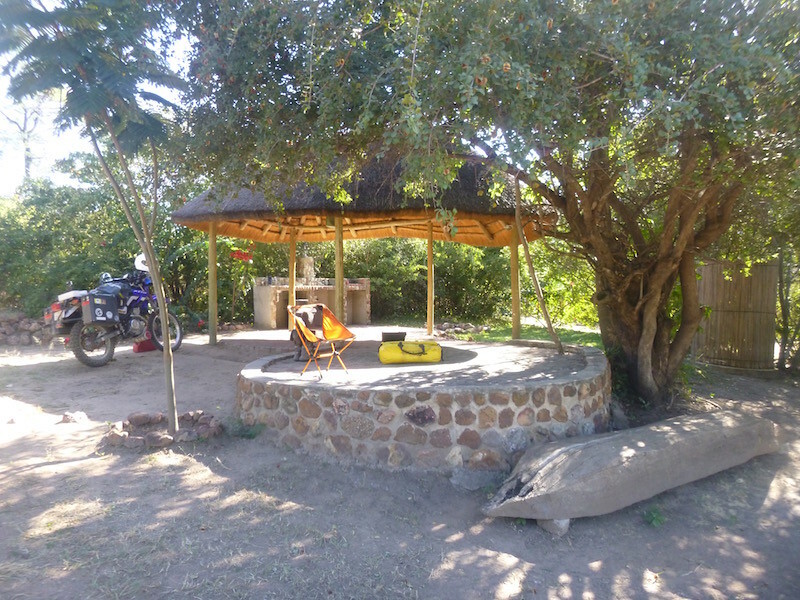 They all have a shade area, and many have three rings with trees in them, along with a braai stand (BBQ). 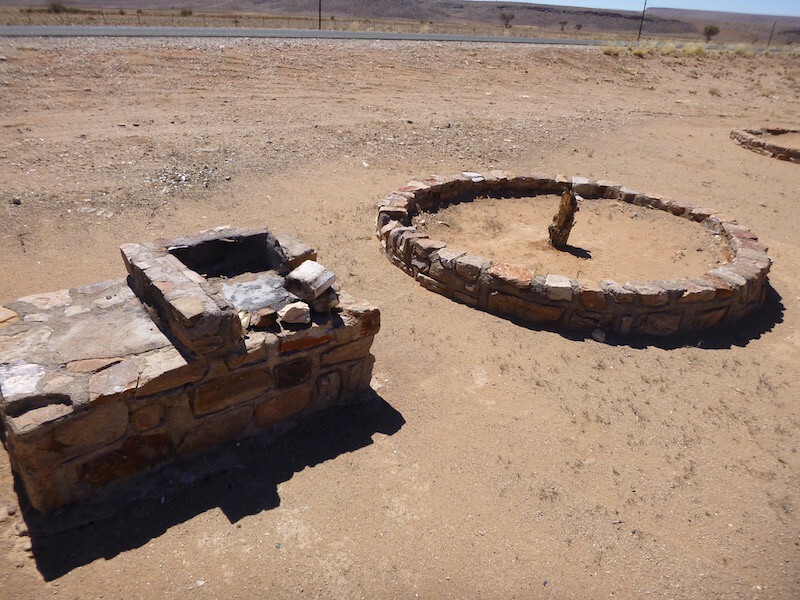 Braai stand at the rest area. The braais are wood-burning. But this is the desert, so where do you find wood?